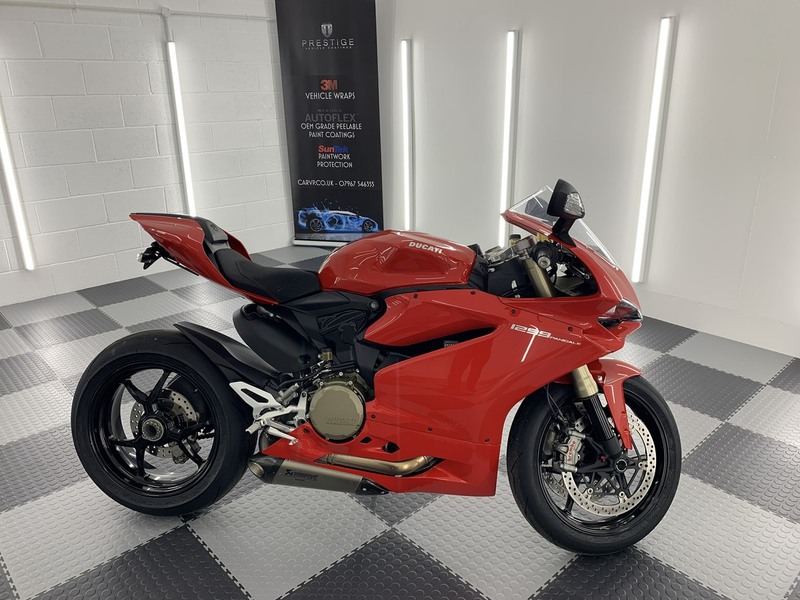 Real world photographs provided by happy customers - and a few extras of interest. 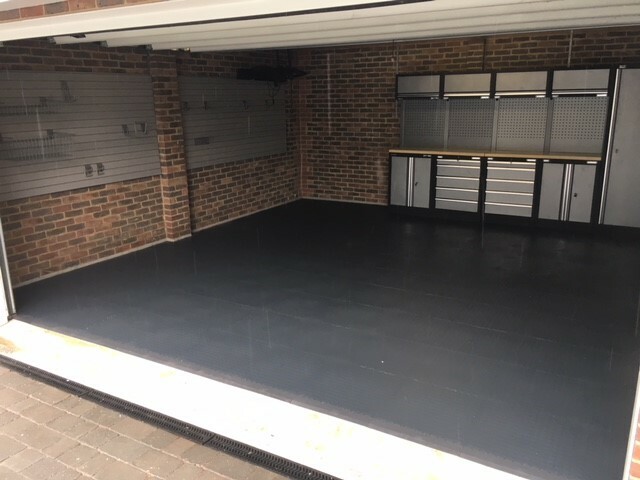 Another garage floor transformed DIY by a customer in a short day. 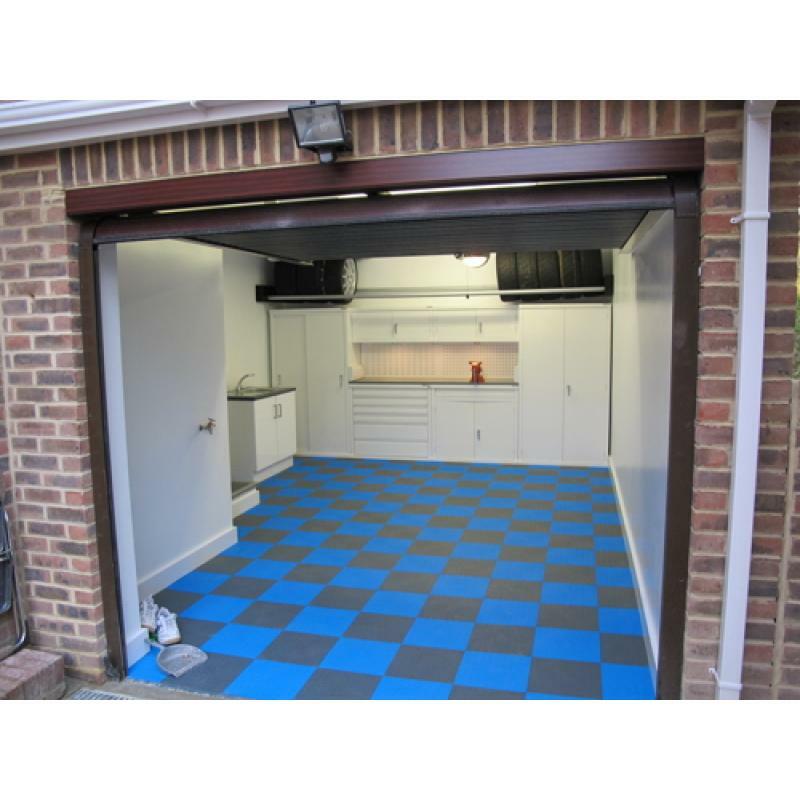 Graphite and dark grey tiles providing a tasteful chequer pattern Note the front ramps nicely positioned just inside the garage door. All loose laid, not bonded. 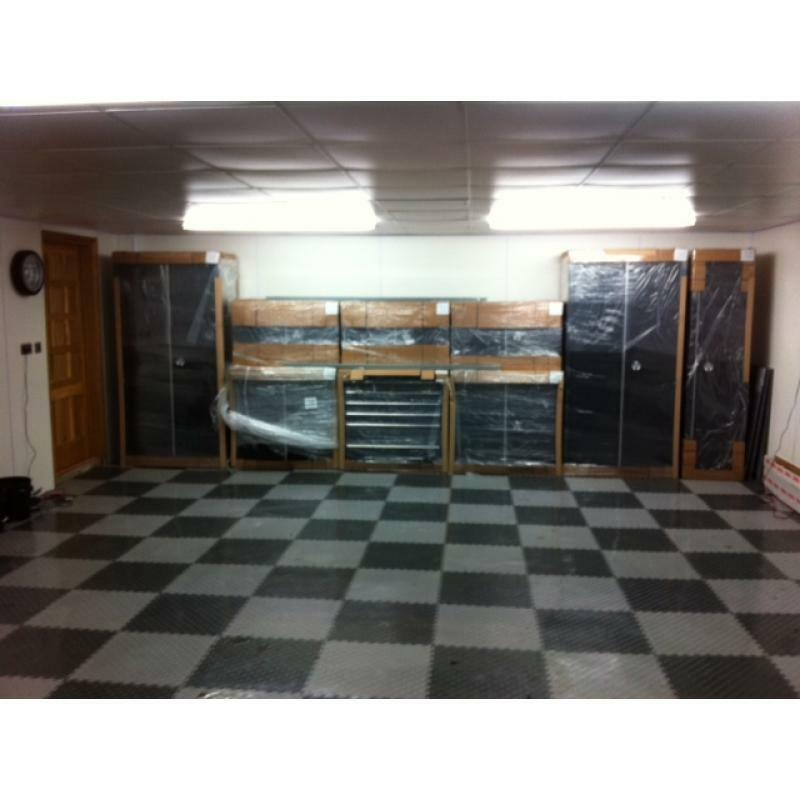 Dust eliminated and garage floor insulated. 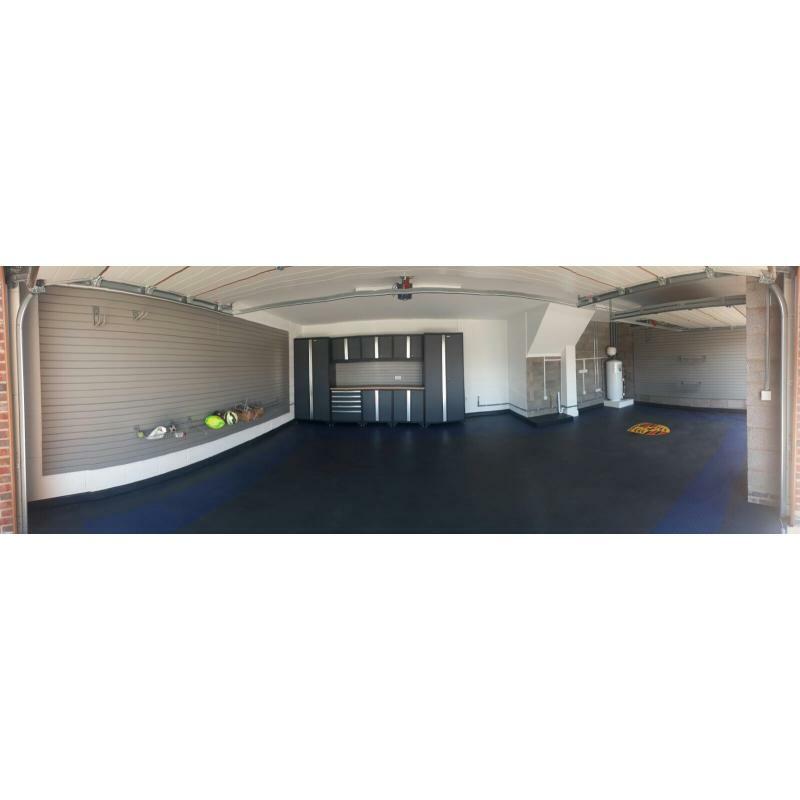 Our most recent large commercial contract. 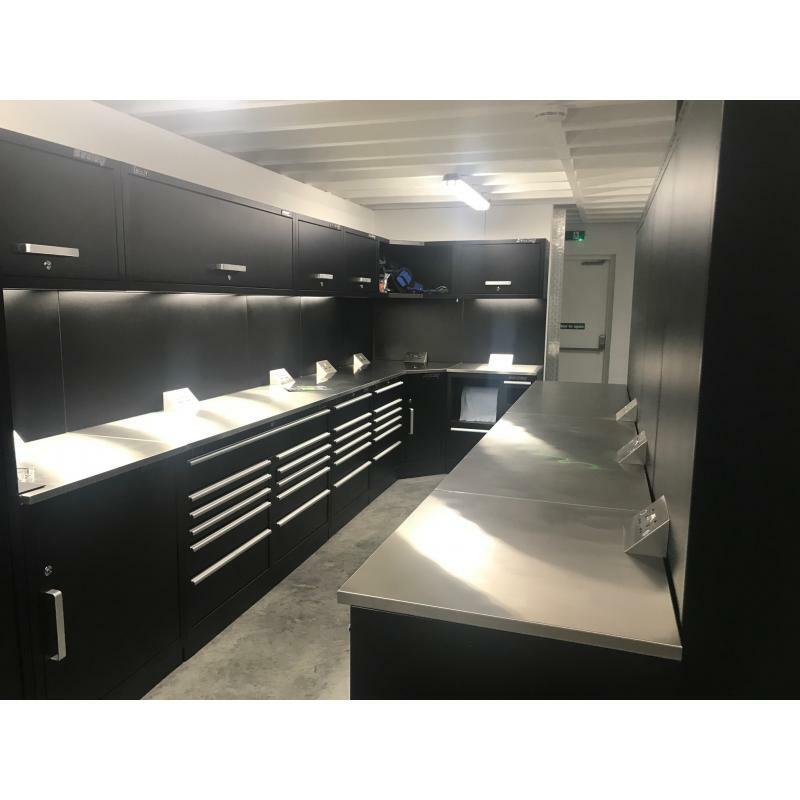 Bott Cubio cabinets designed, supplied and fitted in association with Bott. 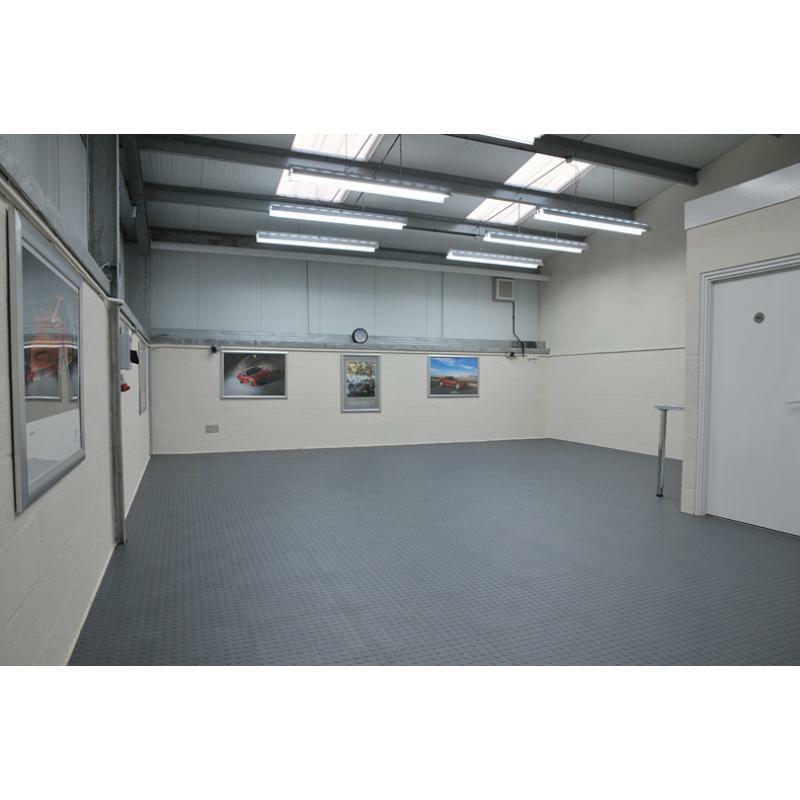 This is ENGIE's power station workshop in Wales. 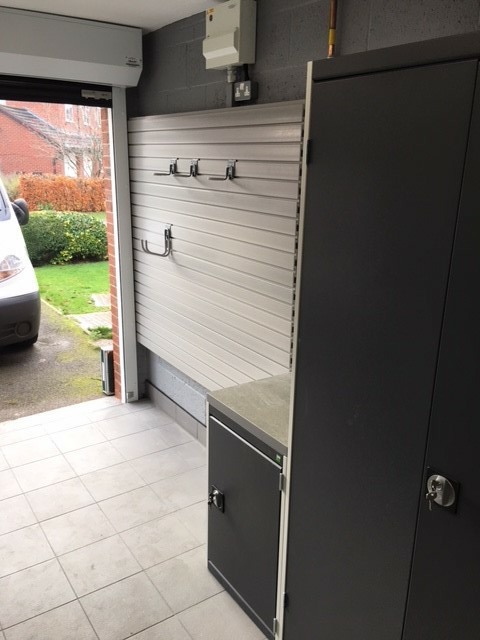 101 uses for a garage No. 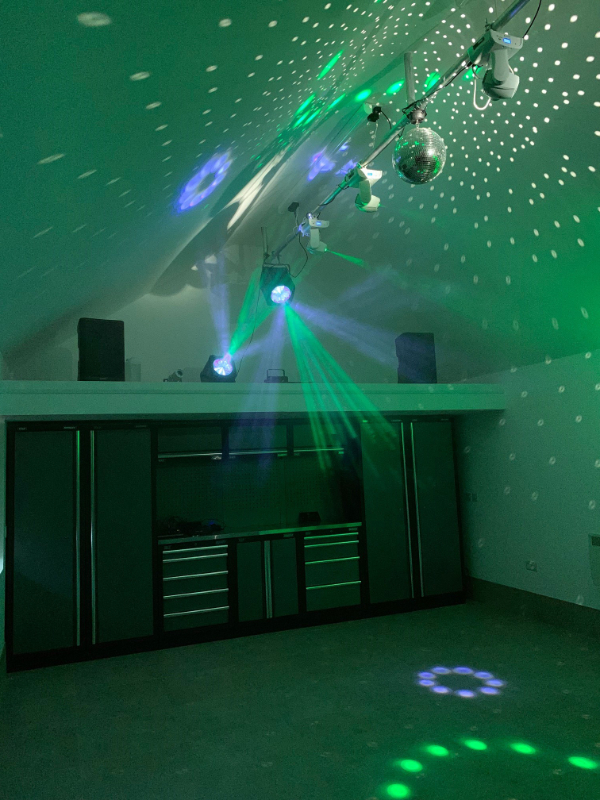 69 - a party room and disco. What will you do with yours? 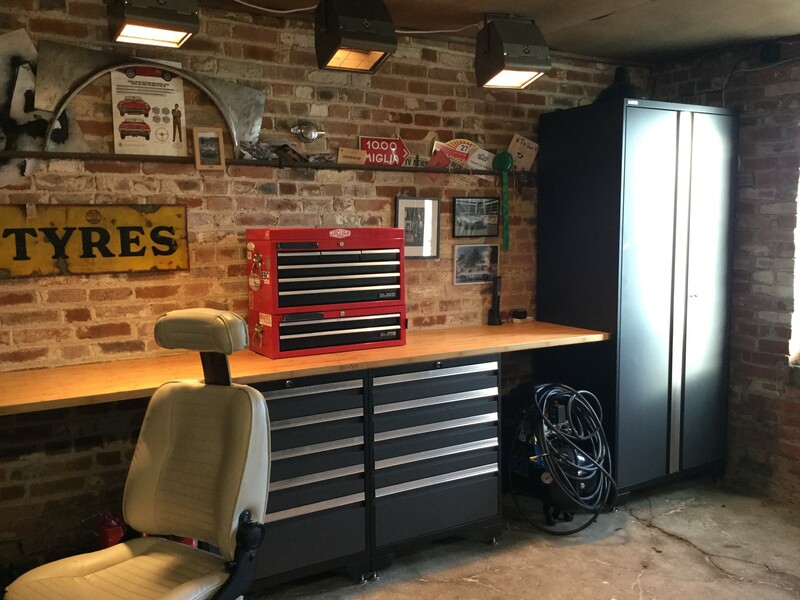 Sealey Superline Pro cabinets on the back wall of a customer's garage. We like the reversed doors on the single tall cupboards providing great symmetry. 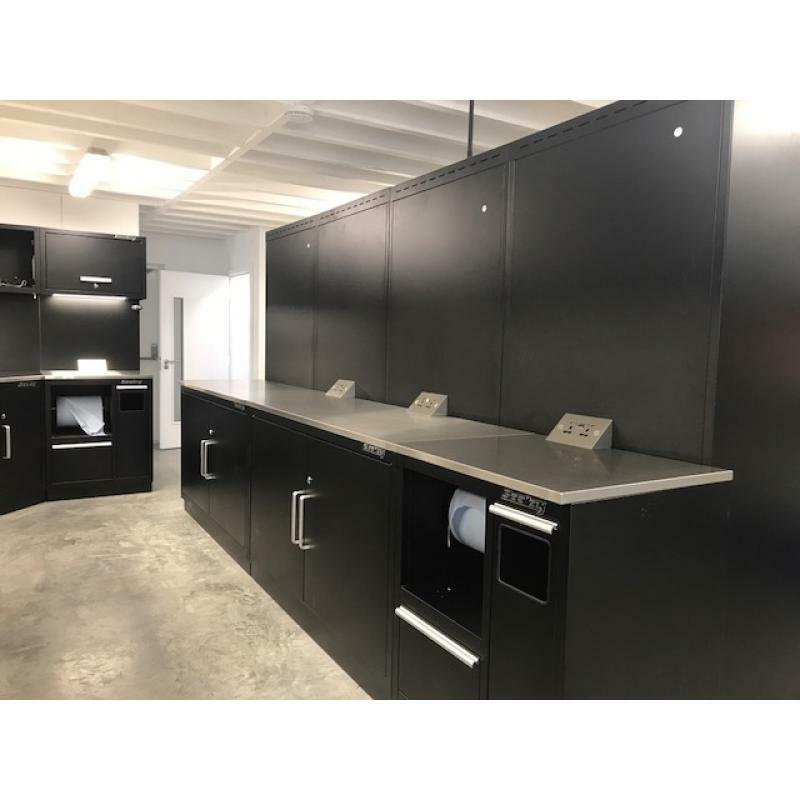 Bott Cubio cabinets with "Lino" worktops and plain back panels. 7mm thick virgin PVC tiles with a smooth texture. 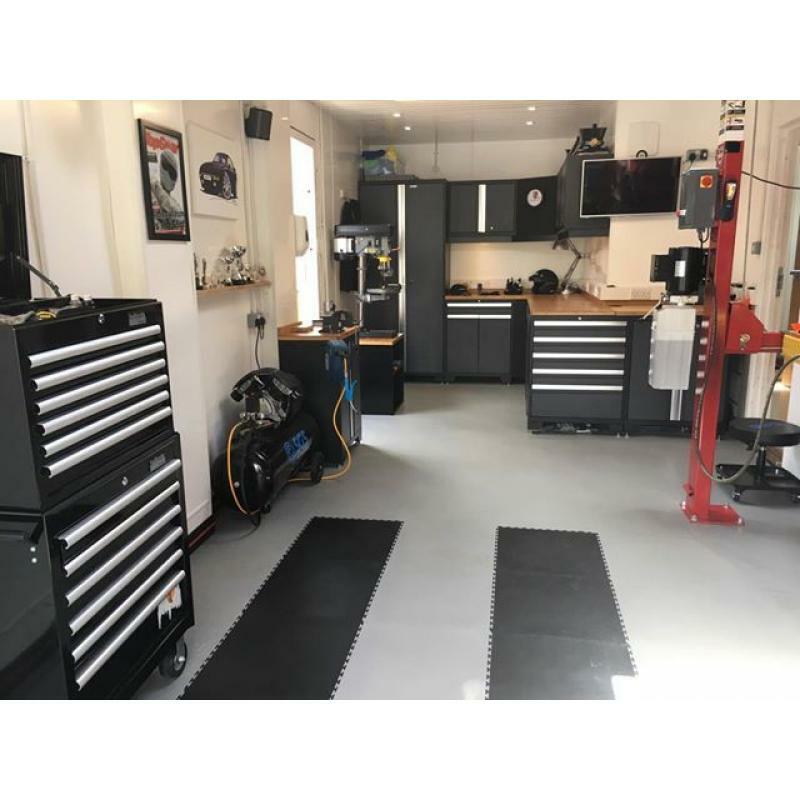 Fitting provided by GaragePride. 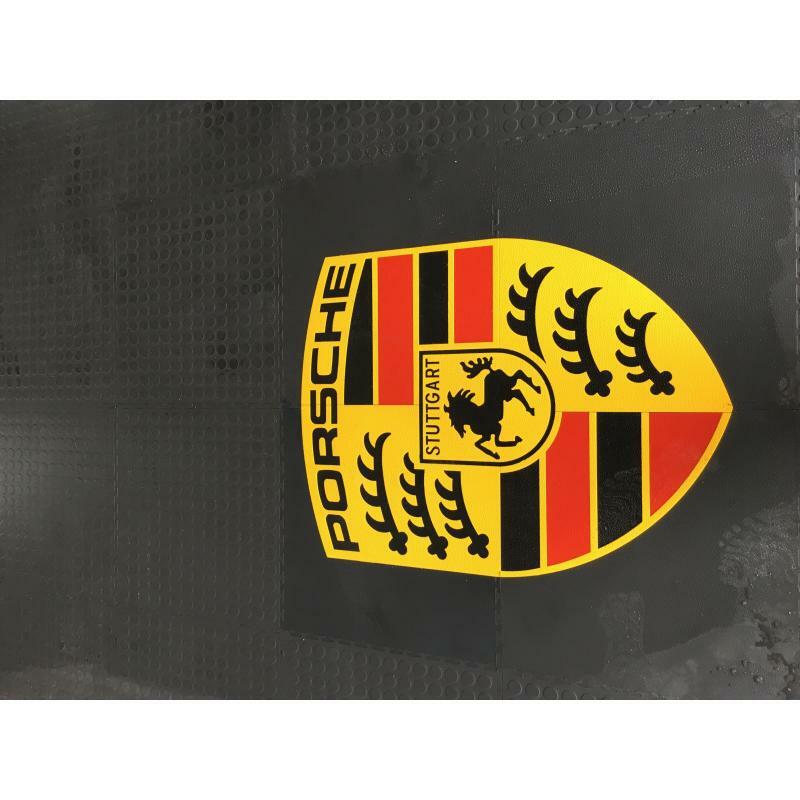 A Ferrari logo produced today for a customer. 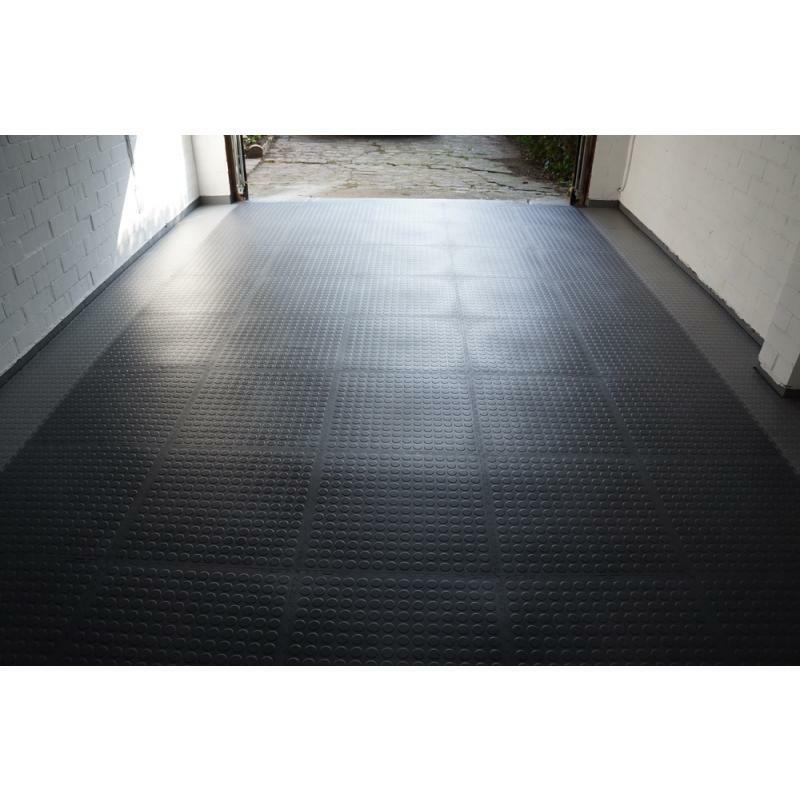 This is water cut into four virgin PVC interlocking tiles (1 square metre). 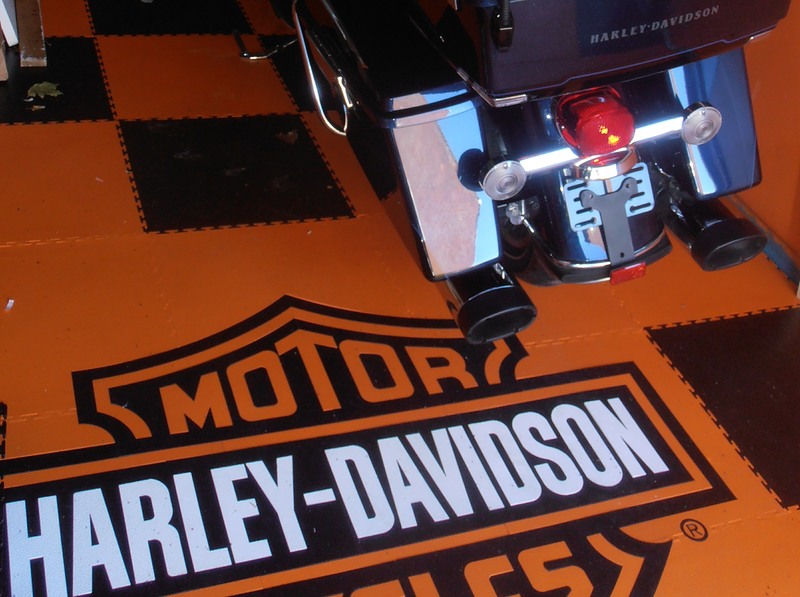 Any logo can be catered for given a reasonably hi-res image. 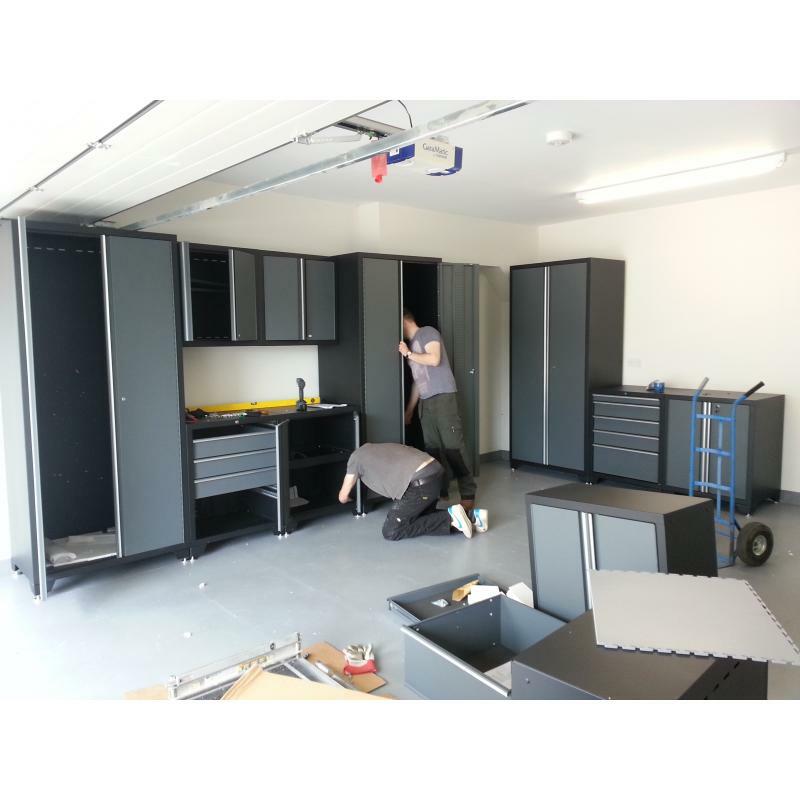 A residential customer's delivery of Bott Cubio cabinets ready for collection by the carrier. 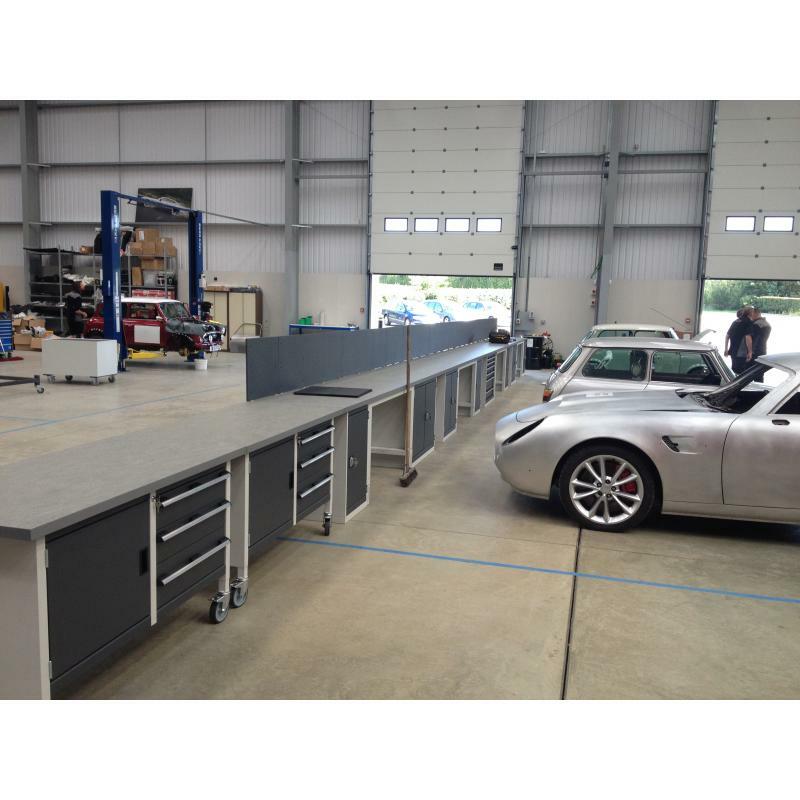 Note the base units, back panels and overhead cabinets pre-assembled at the factory for customers' convenience. 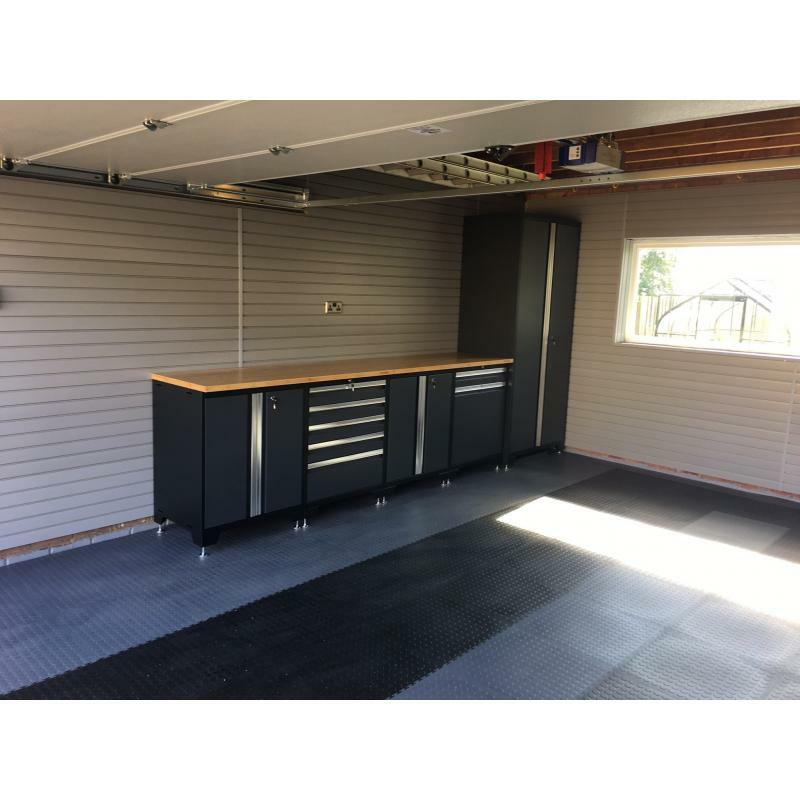 A single garage with Bott Cubio cabinets in light grey and anthracite with plenty of worktop space and a seating area. 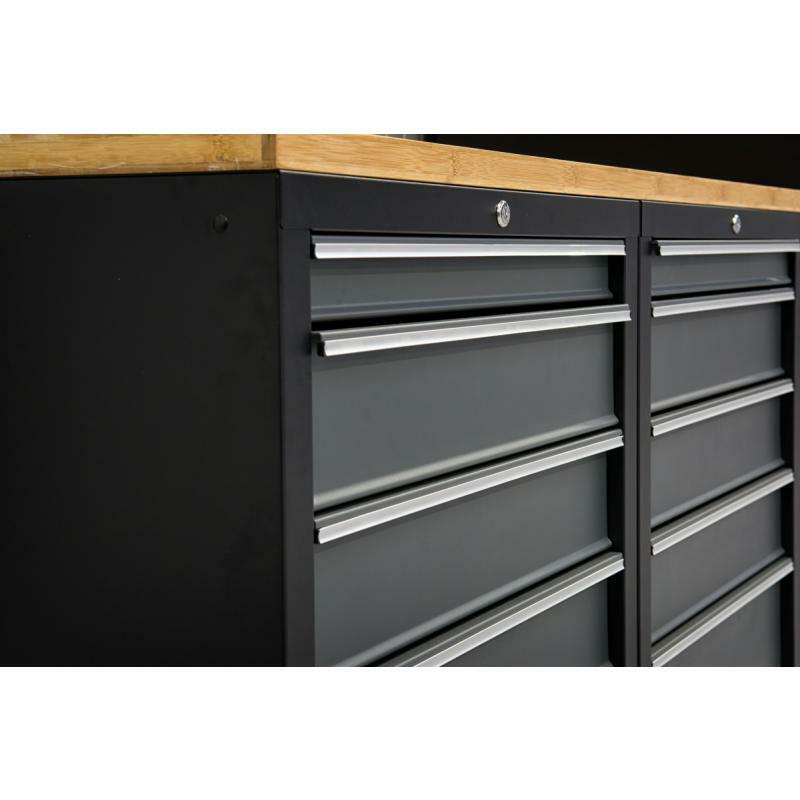 All with a 10 years warranty. 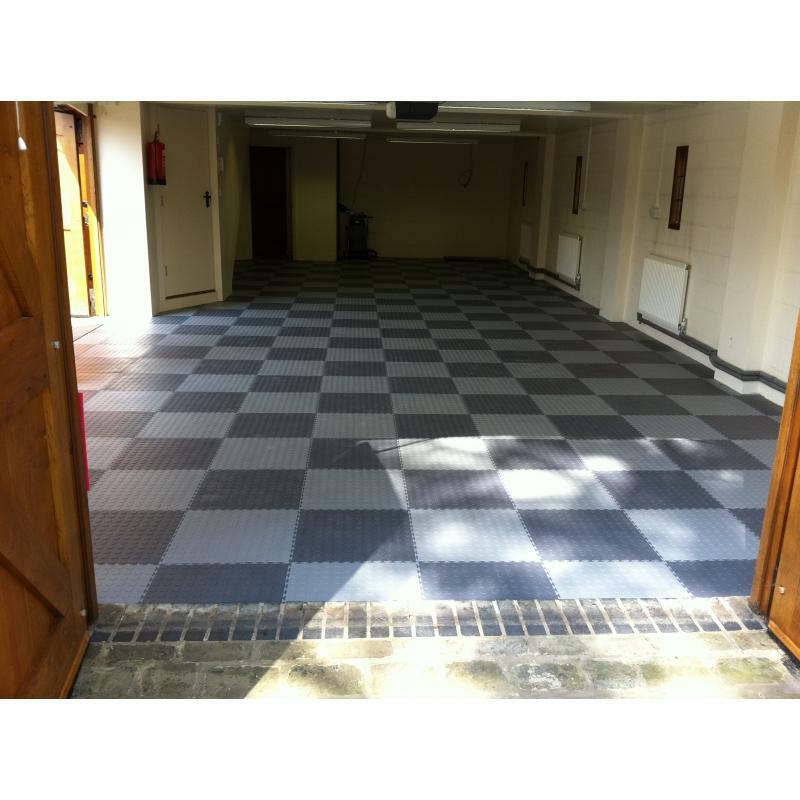 Picture courtesy of customer Smart Repair Systems Ltd. 7mm thick PVC interlocking floor tiles. 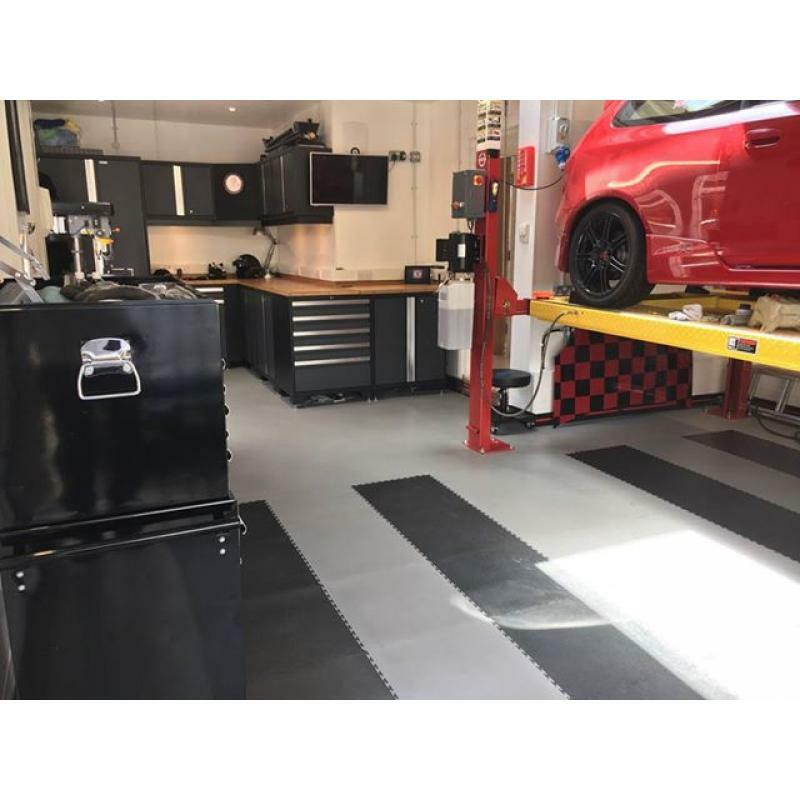 Picture courtesy of customer Smart Repair Systems Ltd. Now with a smart floor in graphite and light grey. Self-laid in a few hours, minimal downtime. A customer in Japan showing us his enamel sign purchased from us recently. It's good to see an Elan and union flag over there! A customer in Sevenoaks. 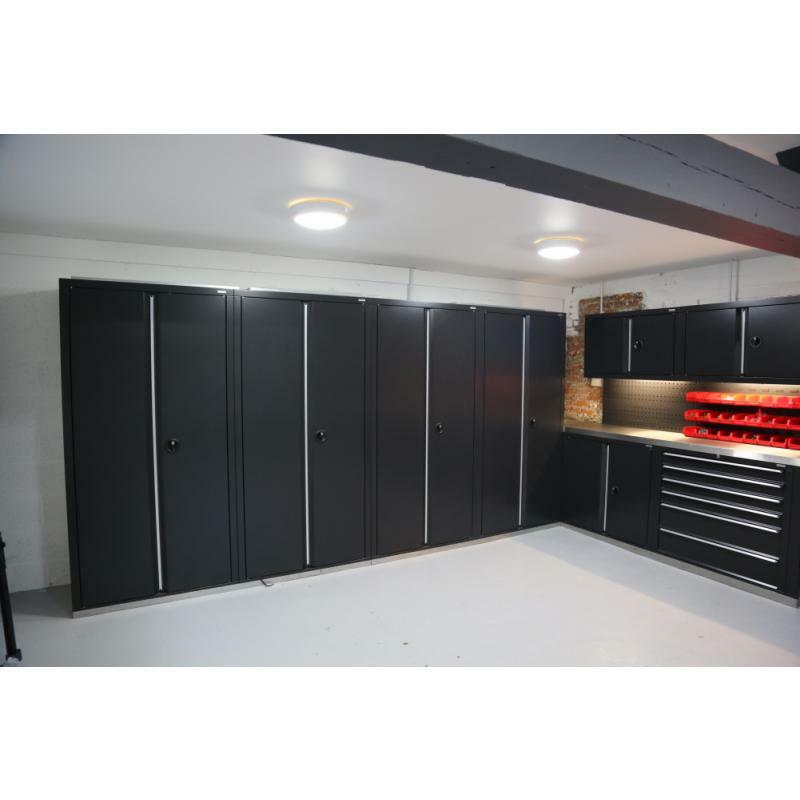 Sealey Superline Pro cabinets, 7mm thick interlocking PVC floor tiles, and wall storage panels. 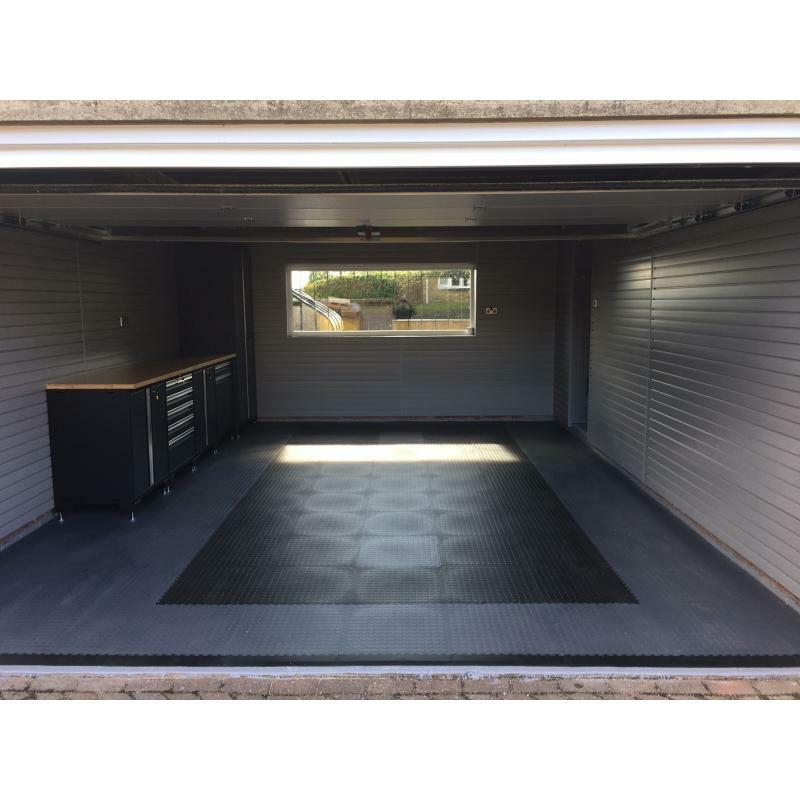 A customer in south Wales spent a weekend creating his perfect garage with PVC interlocking floor tiles and cabinets in black and grey. 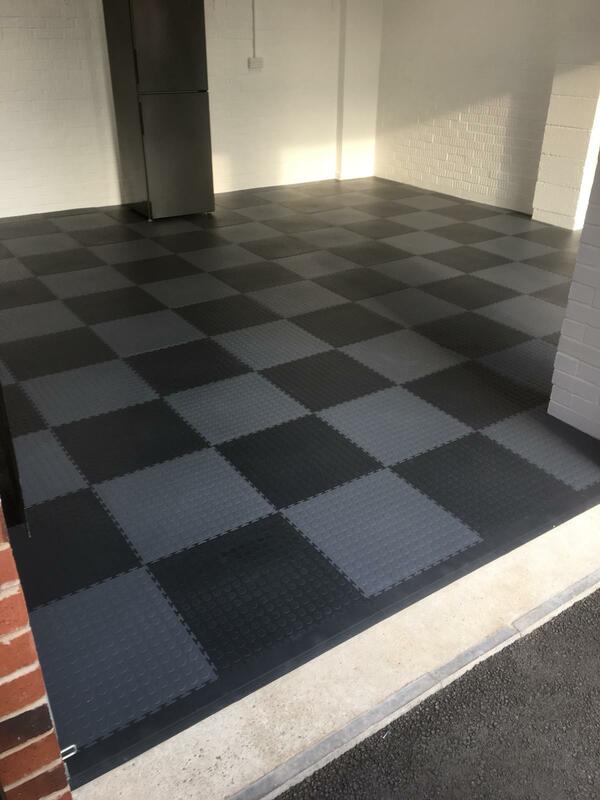 A customer's DIY floor tiles installation completed in a few hours. 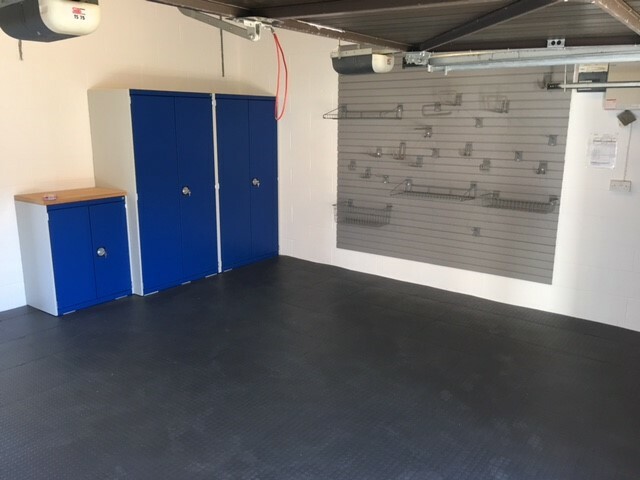 A garage floor transformed. 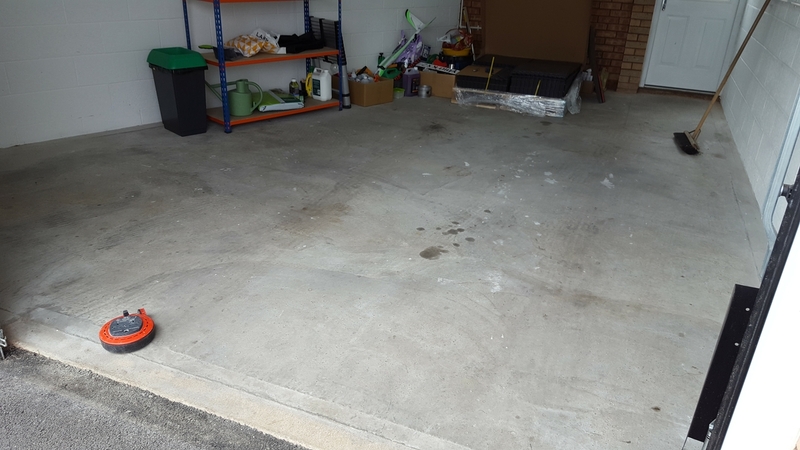 A customer's cold, dusty concrete garage floor prior to his DIY installation. Note the heavily angled wall. And now for something completely different! 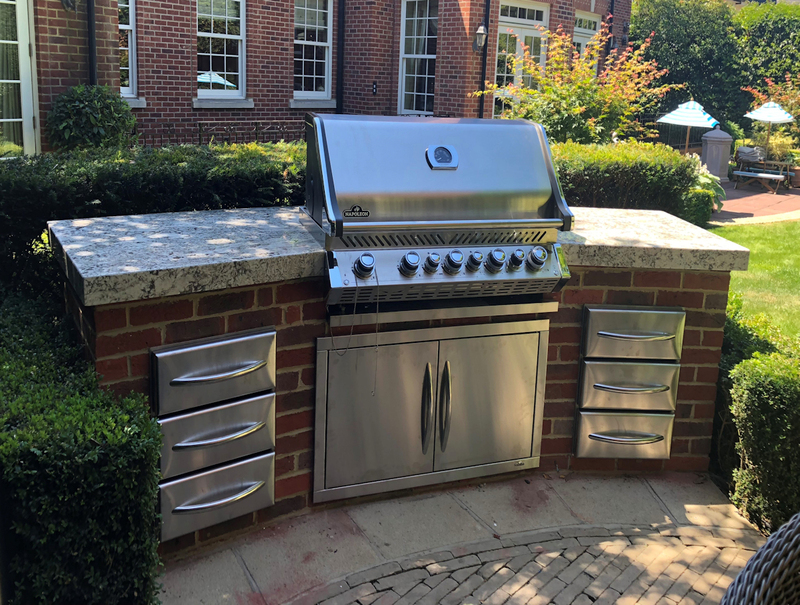 A customer's top end Napoleon grill and built-in drawers and cupboard. 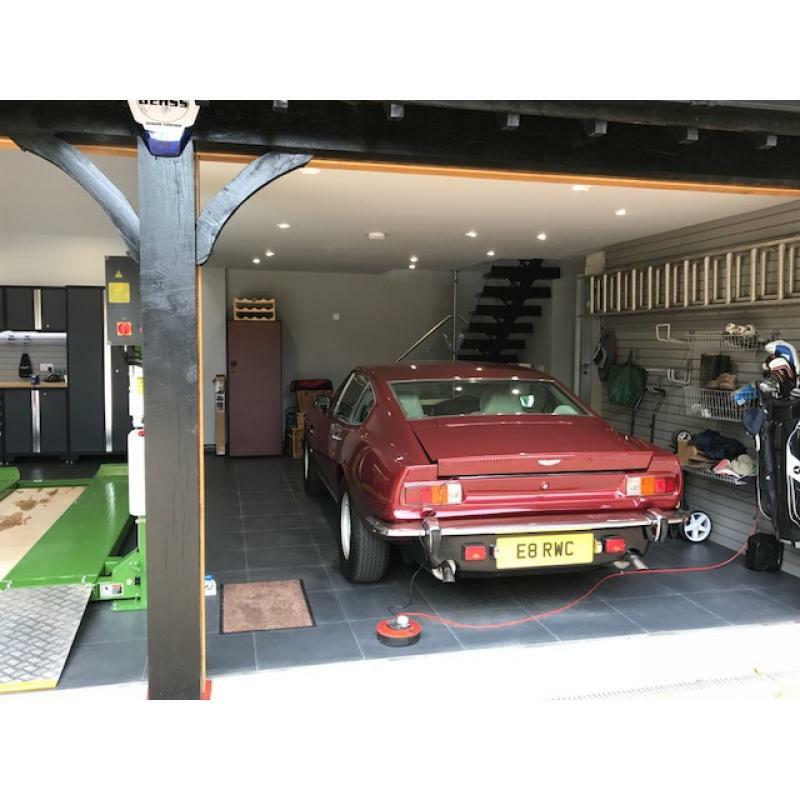 Supplied by GaragePride. 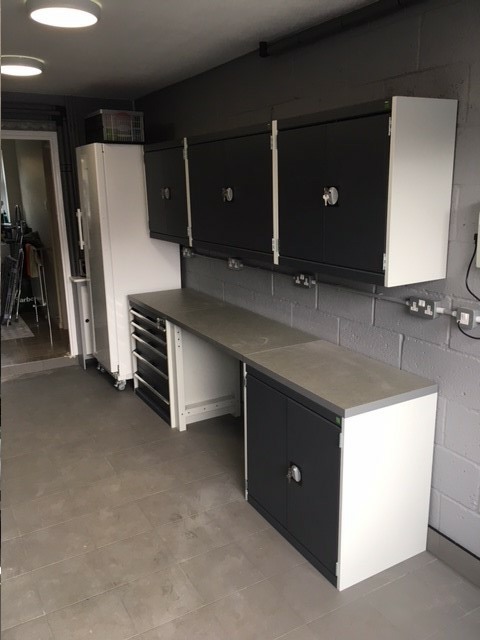 A customer's self-fitted corner installation of Sealey Superline Pro cabinets and interlocking floor tiles. 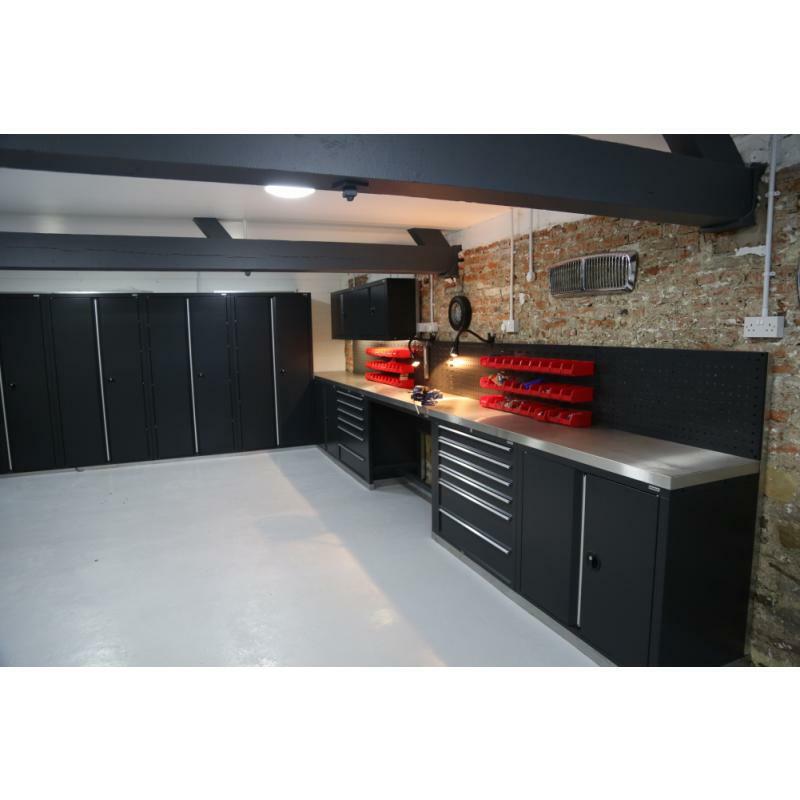 A garage interior design proposal completed and supplied for Sportax Racing. Sealey Superline Pro including two corner arrangements. Stainless steel kitchen units in the corner. 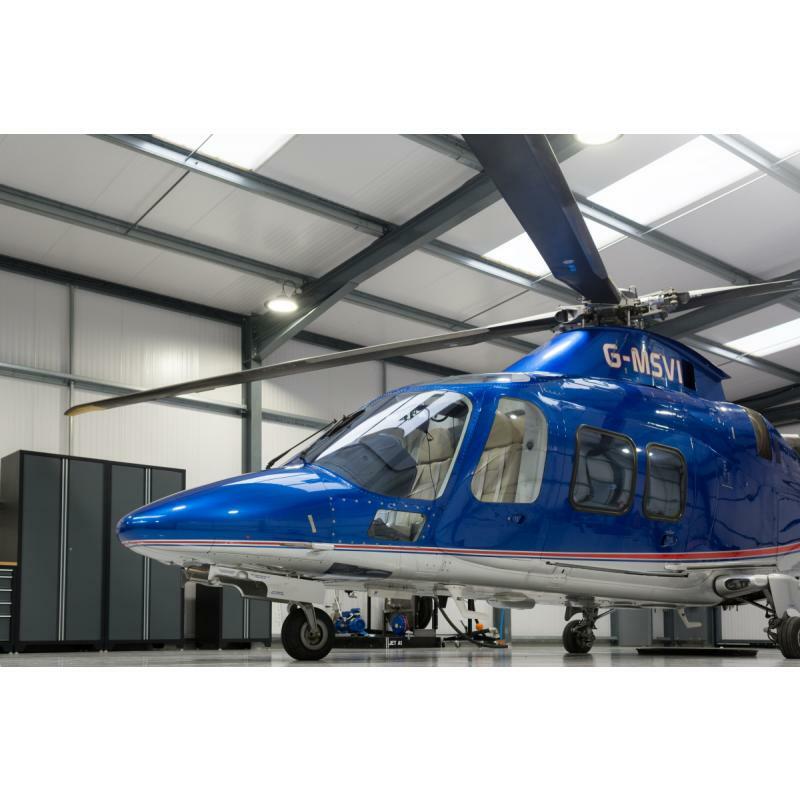 Let us produce one meeting your particular requirements. 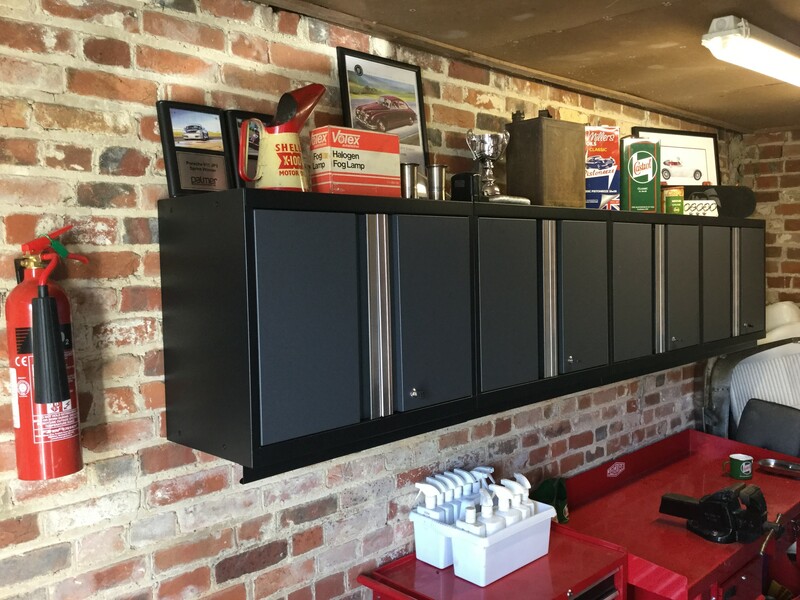 A customer's line-up of garage wall cabinets creating shelves for motoring memorabilia. November 2017. 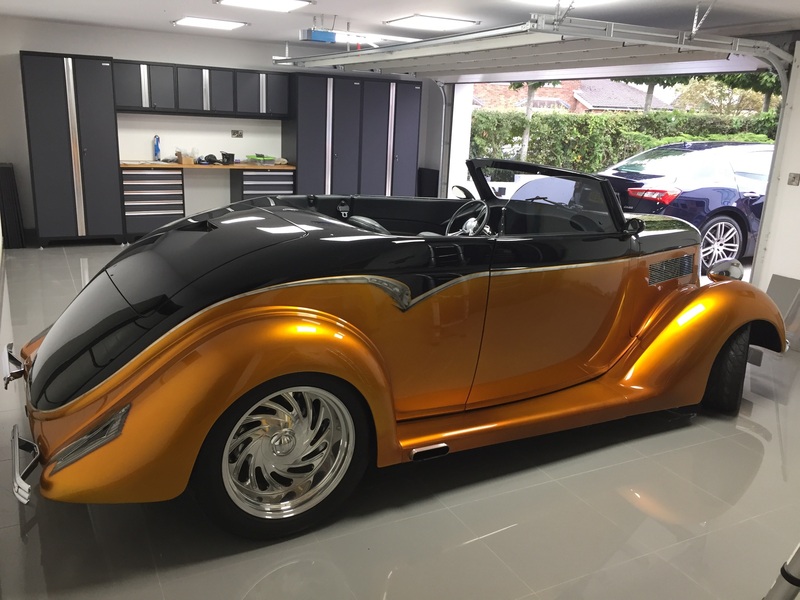 A customer's beautiful Ford hot rod - and a set of our Pro Series cabinets. A great combination! November 2017. 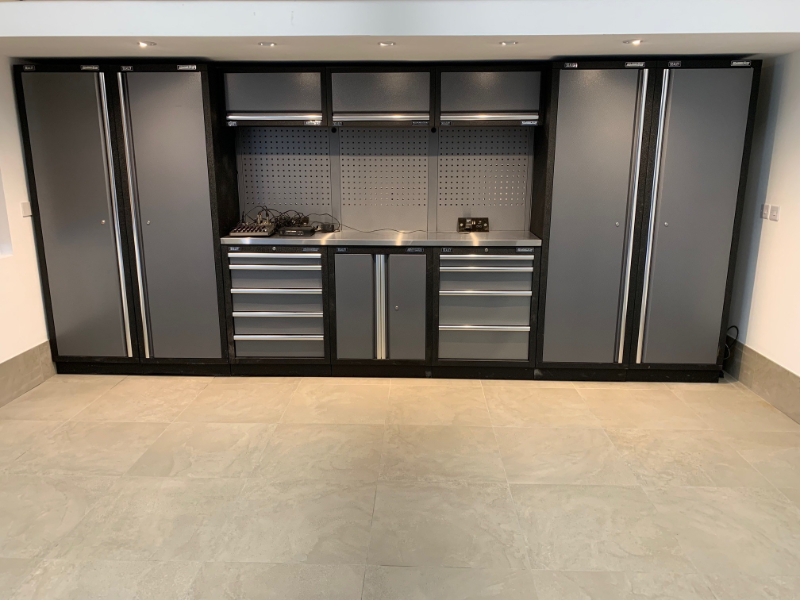 A customer photo showing his Bott Cubio cupboards, wall storage system, and garage floor tiles in graphite. 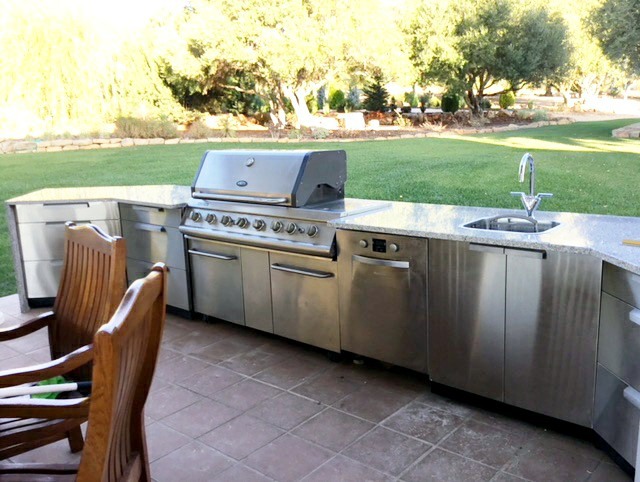 A customer's photograph from Portugal showing her stainless steel outdoor kitchen cabinets in place. A dimensioned layout proposal supplied to a commercial customer. 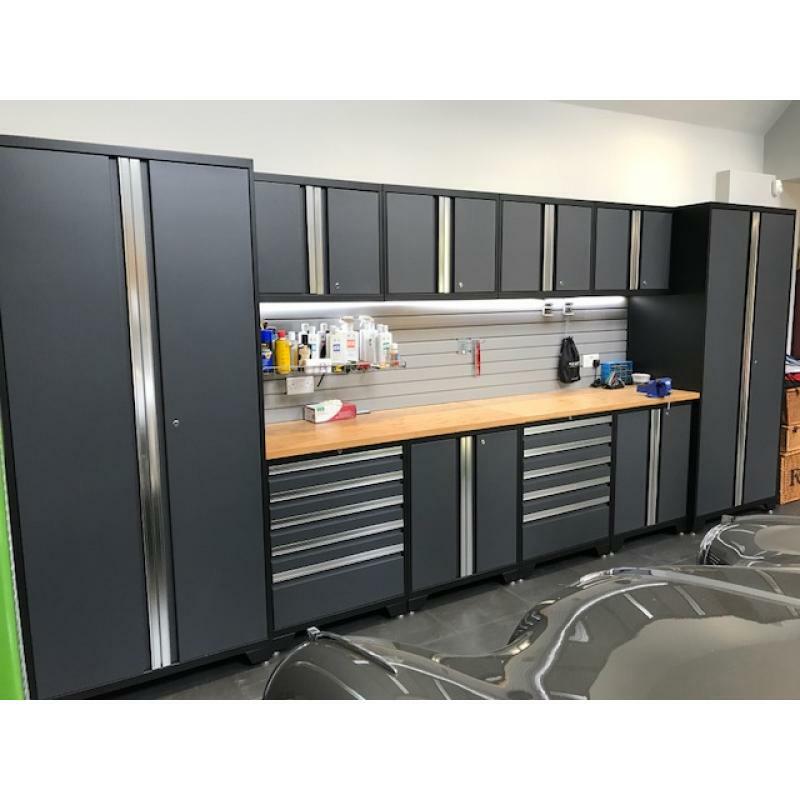 A customer's brilliant layout of our Sealey Premier cabinets. 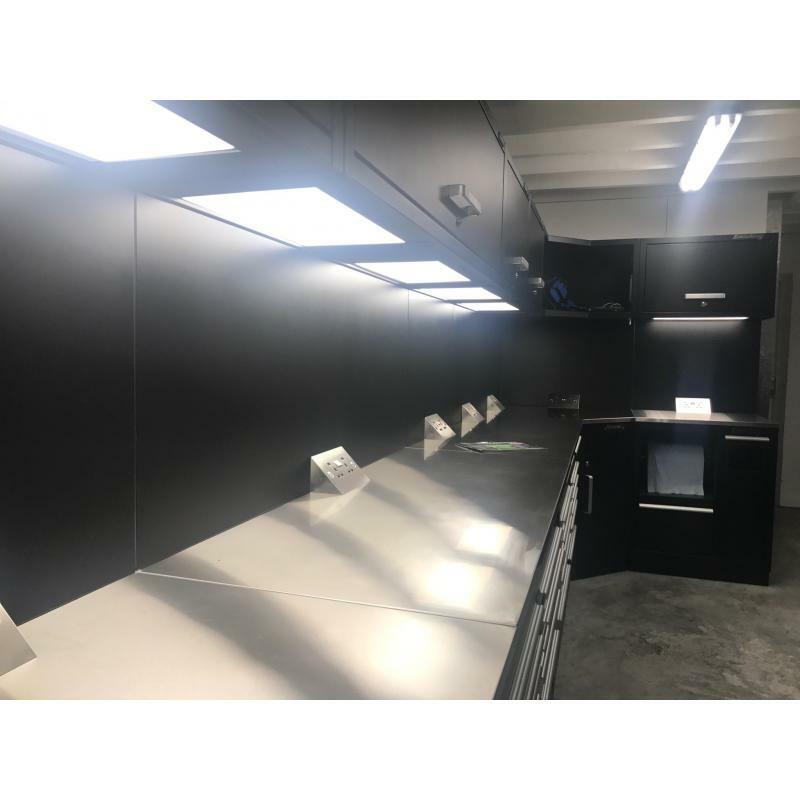 With a corner arrangement, stainless steel worktops and his own lighting. 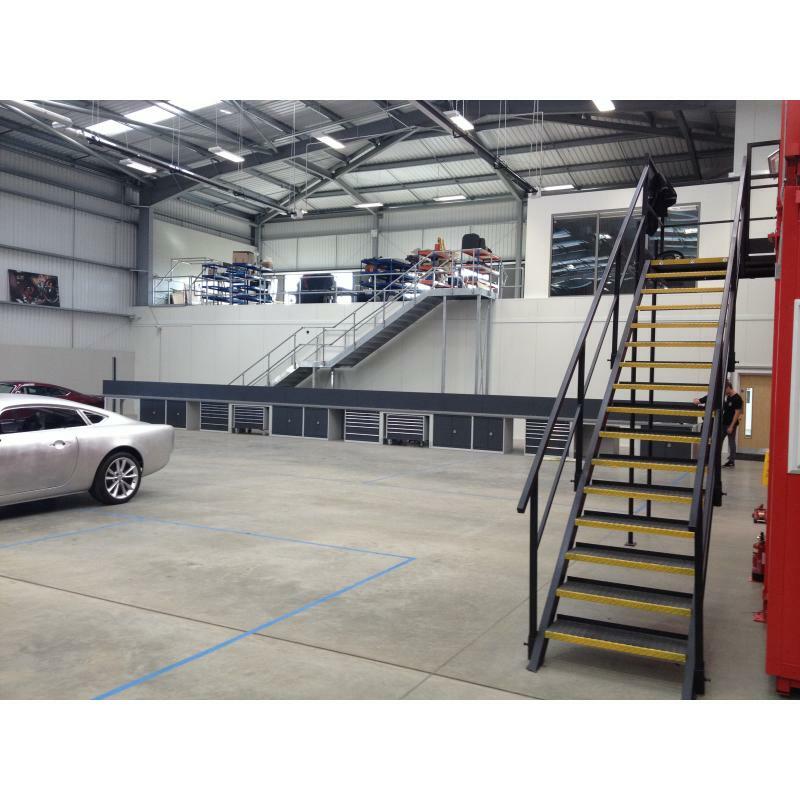 David Brown Automotive's new facility near Silverstone. 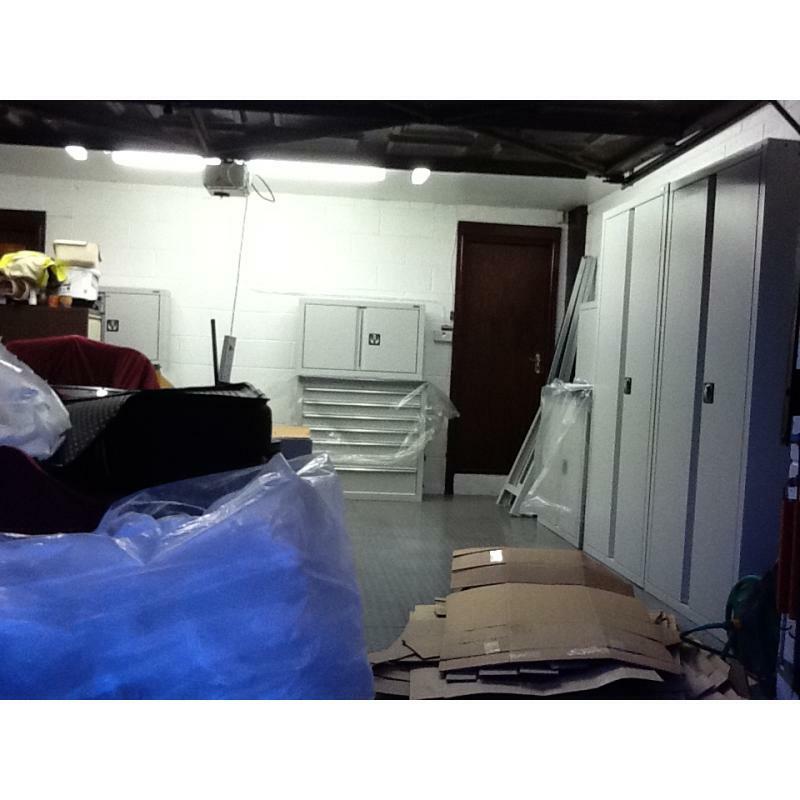 Bott Cubio cabinets supplied. 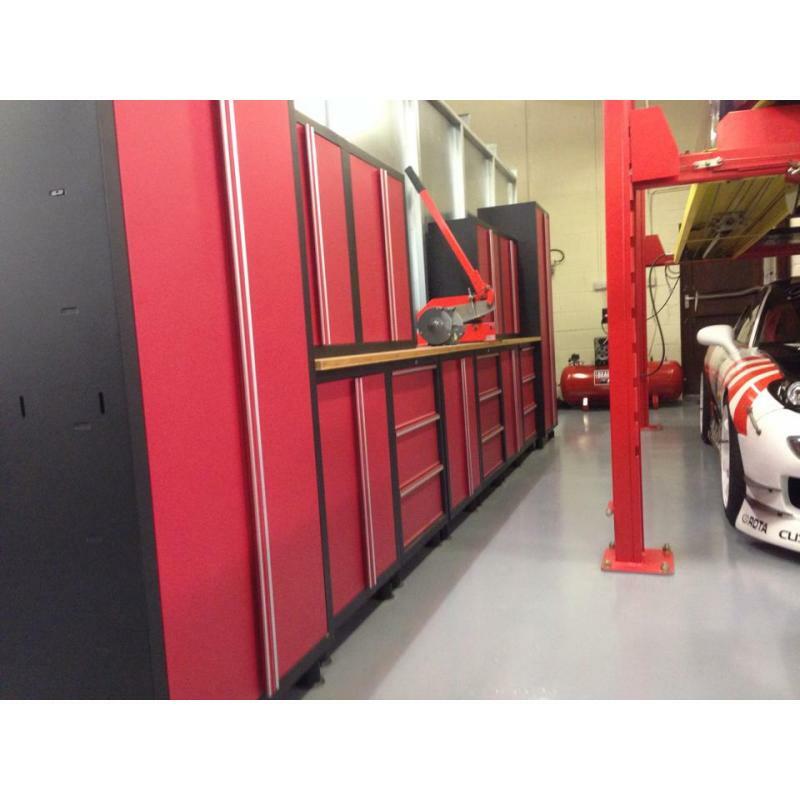 Layout designed by GaragePride. Customer Andy Watson, Colchester. 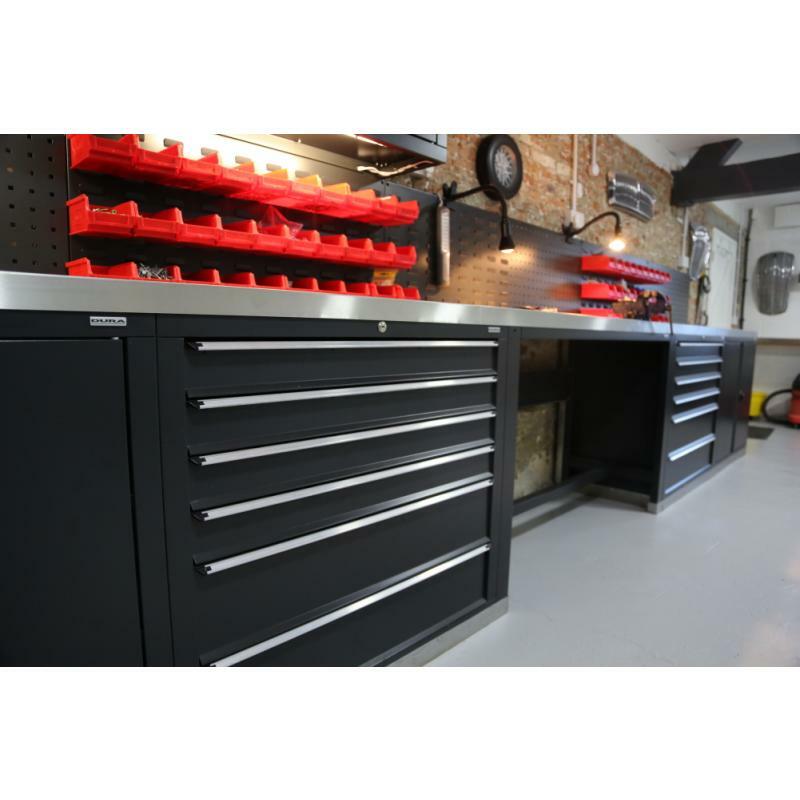 Highly functional home garage. 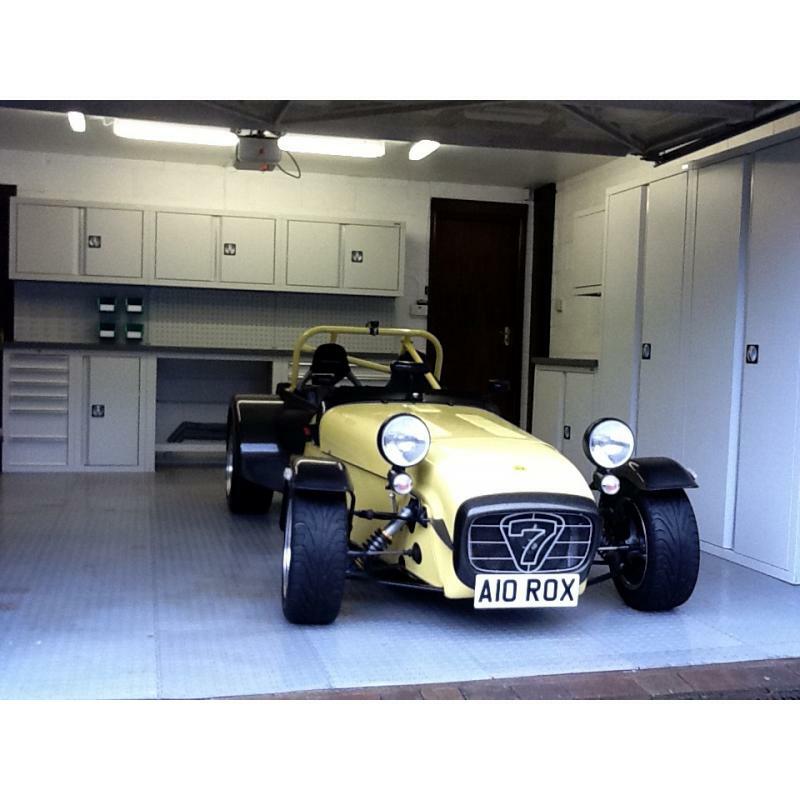 Light grey tiles for lightness with black stripes to hide tyres marks. 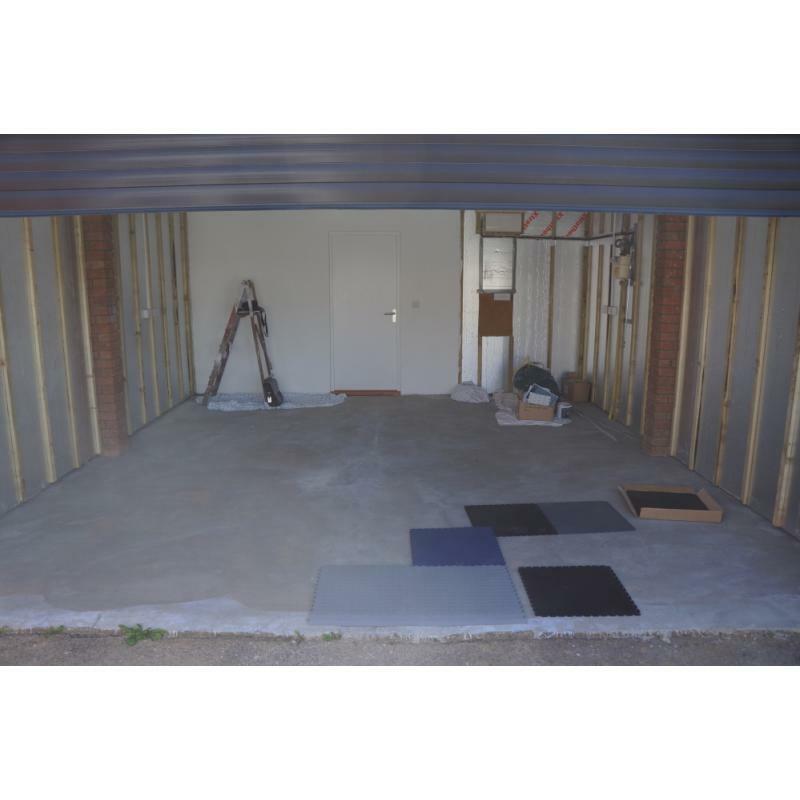 Double garage before fitting. 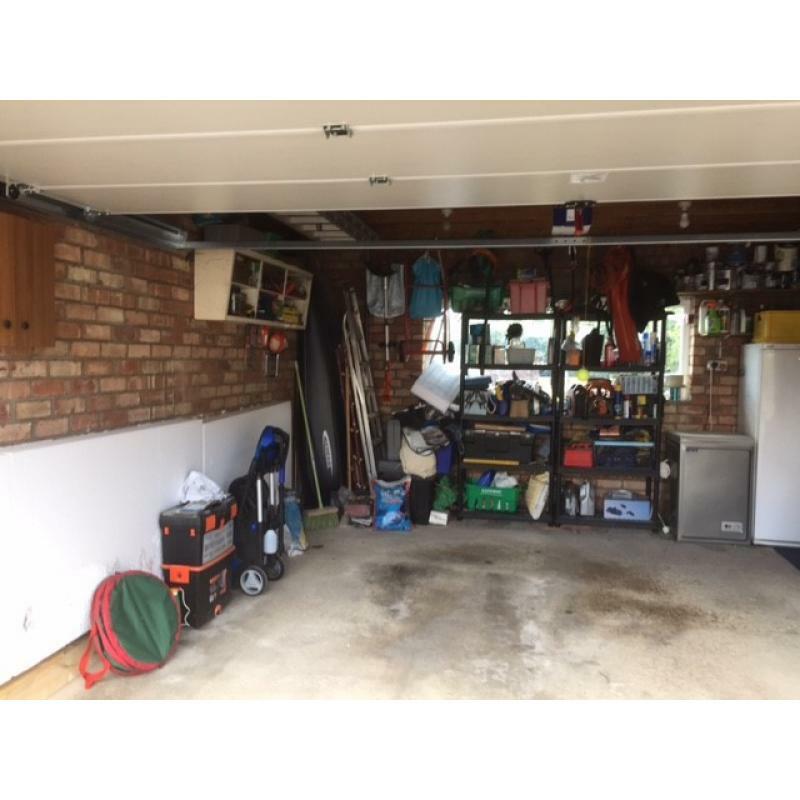 A typical residential garage perhaps? 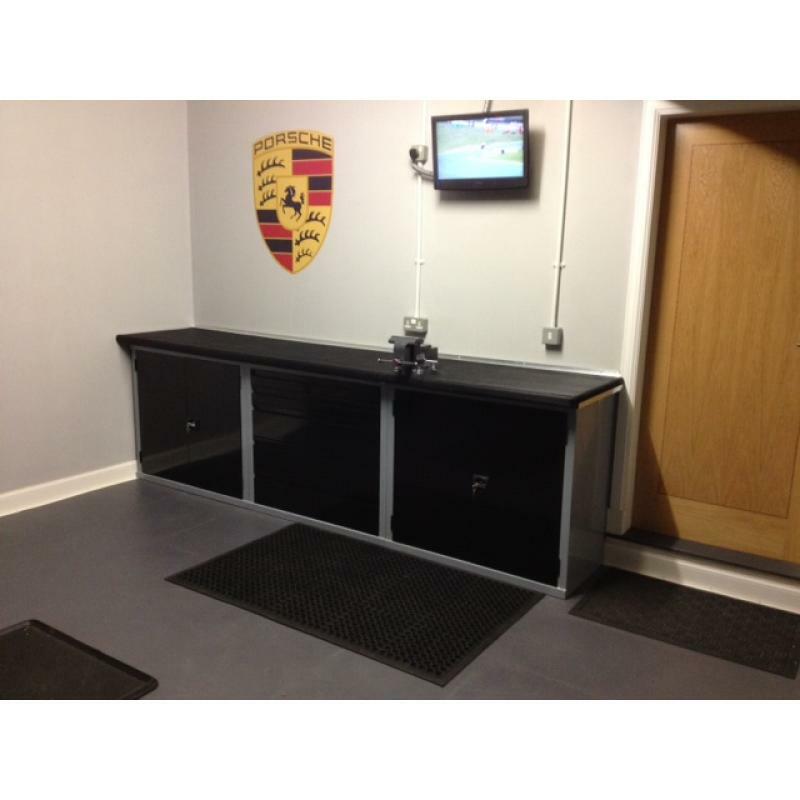 Garage fitted in July 2017, steel cabinets, floor tiles with Porsche logo, and wall storage. 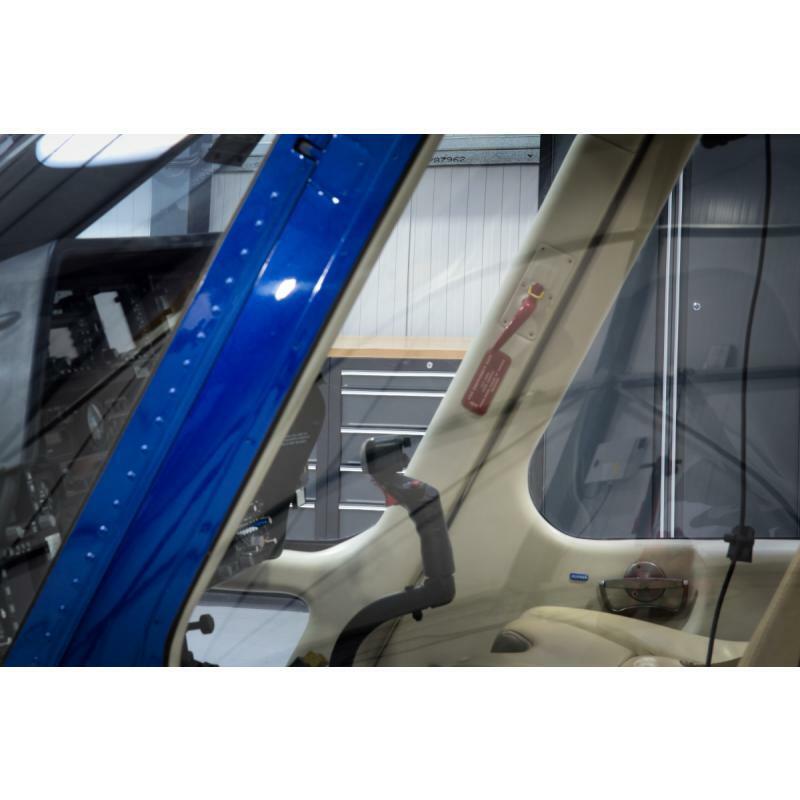 Pro Series cabinets reflecting in a customer's Aston Martin. June 2017. 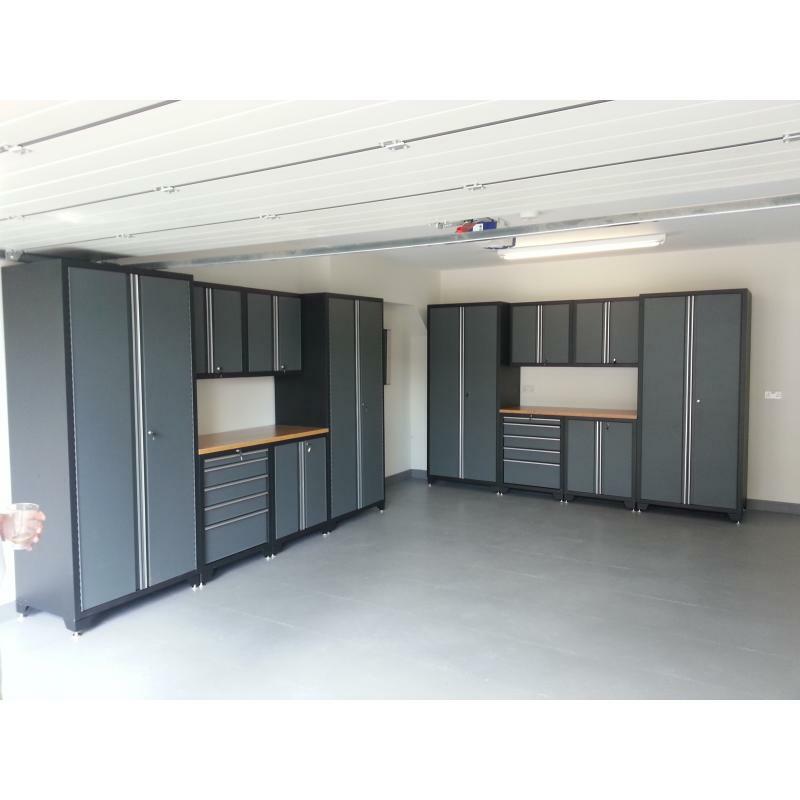 Pro series cabinets in a customer's helicopter hangar. 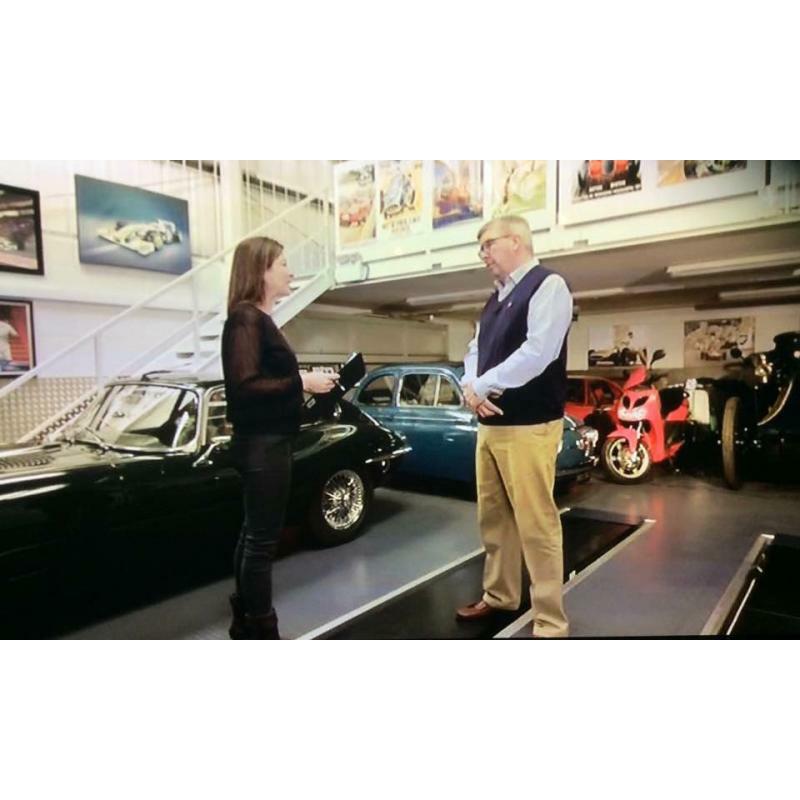 Good customer F1 supremo Ross Brawn standing on his interlocking PVC floor tiles supplied by GaragePride. 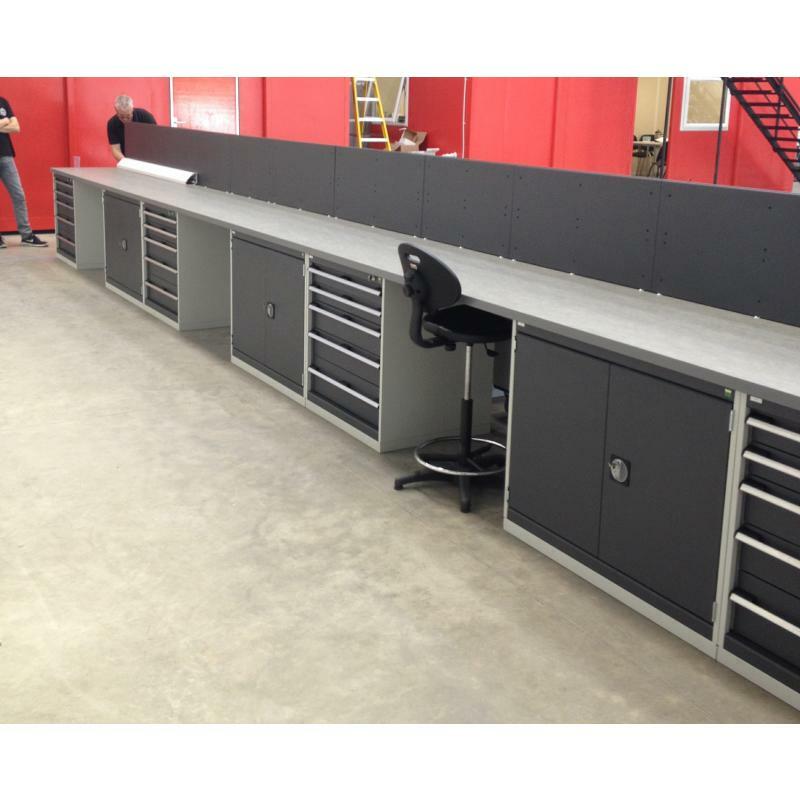 Pro Series cabinets complete and ready to be filled. 2000mm high and 610mm deep. 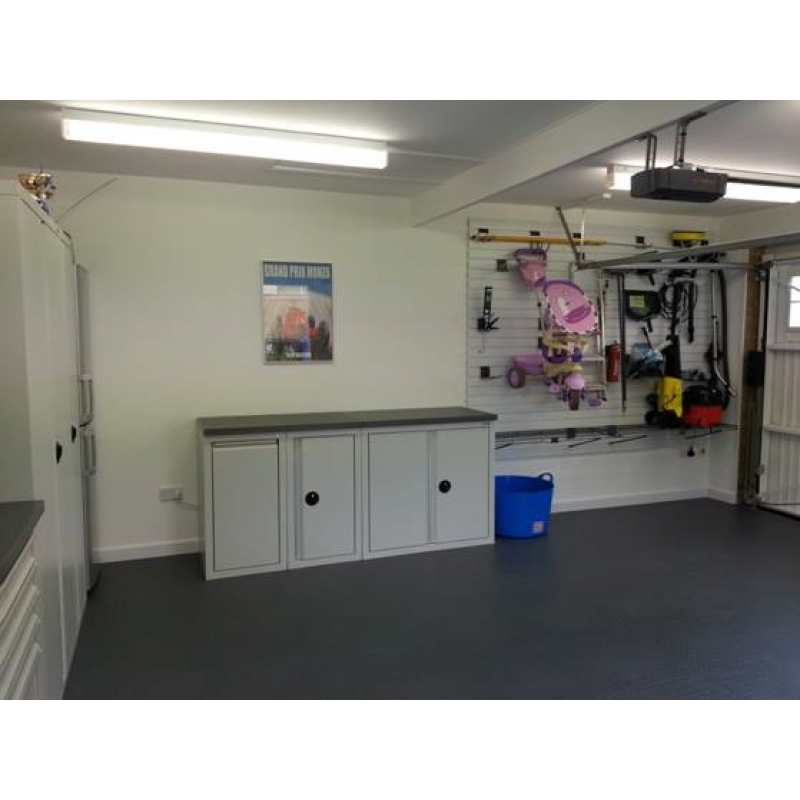 A residential workshop modelled and supplied by GaragePride. 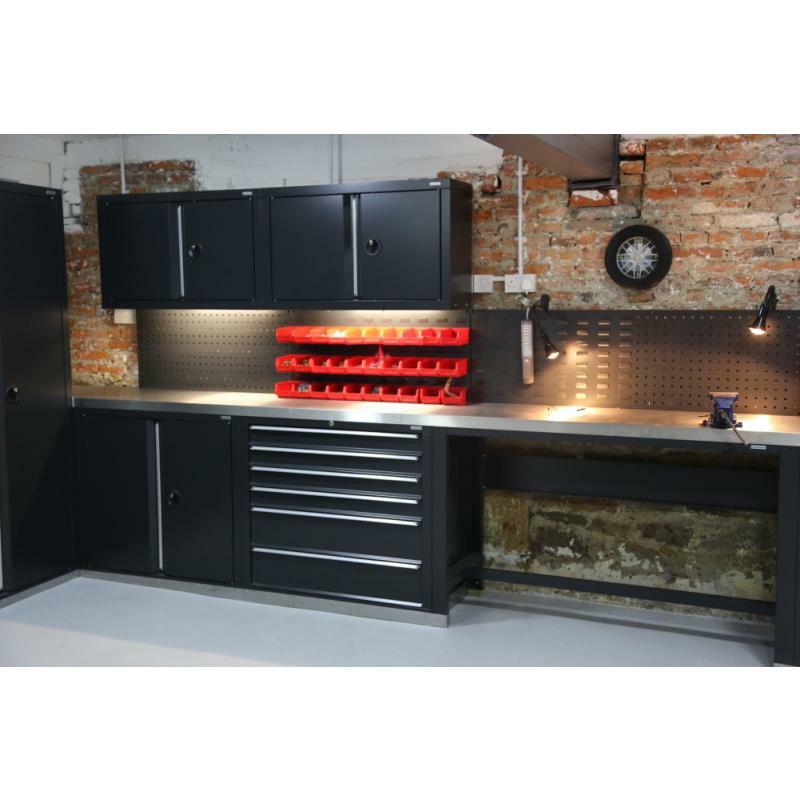 A great combination of cupboard storage and worktops. A workbench and lighting was added to the layout. 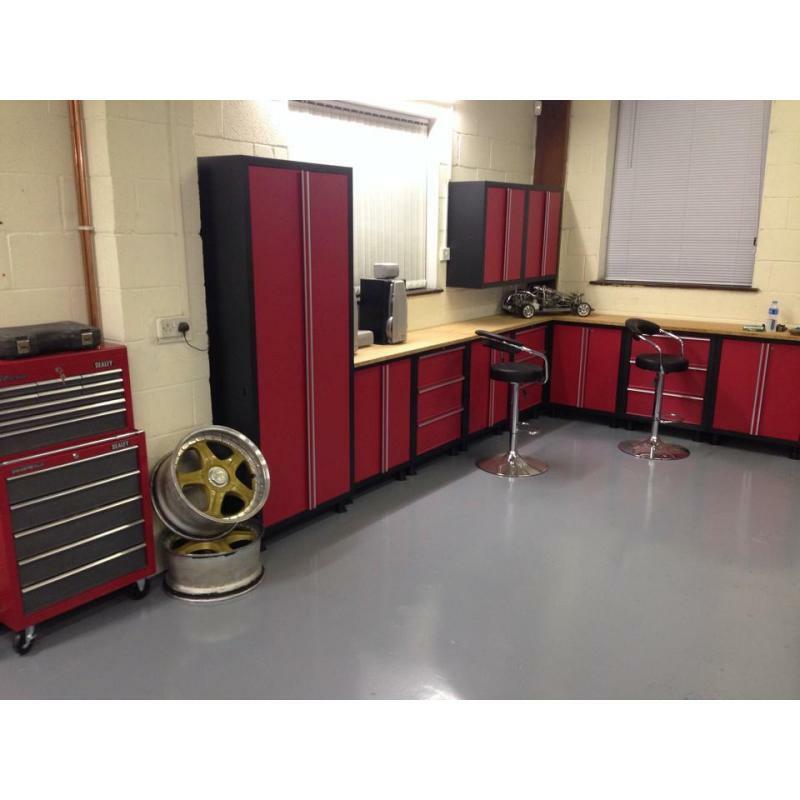 Black and red heavy duty cabinets in a vehicle detailing workshop. 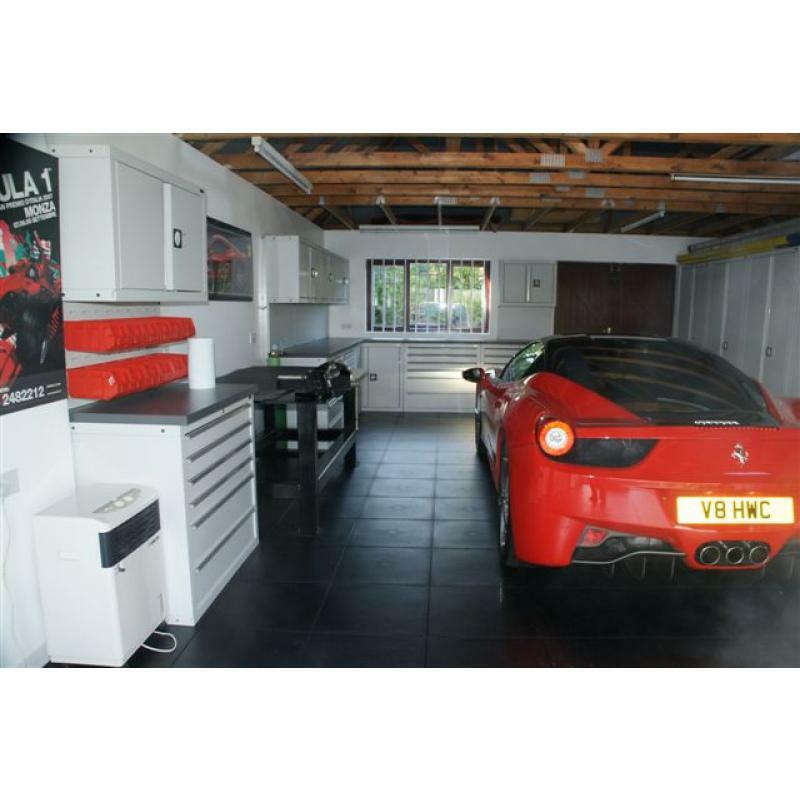 A large garage using light grey cabinets with black tiles and Ferrari 458. 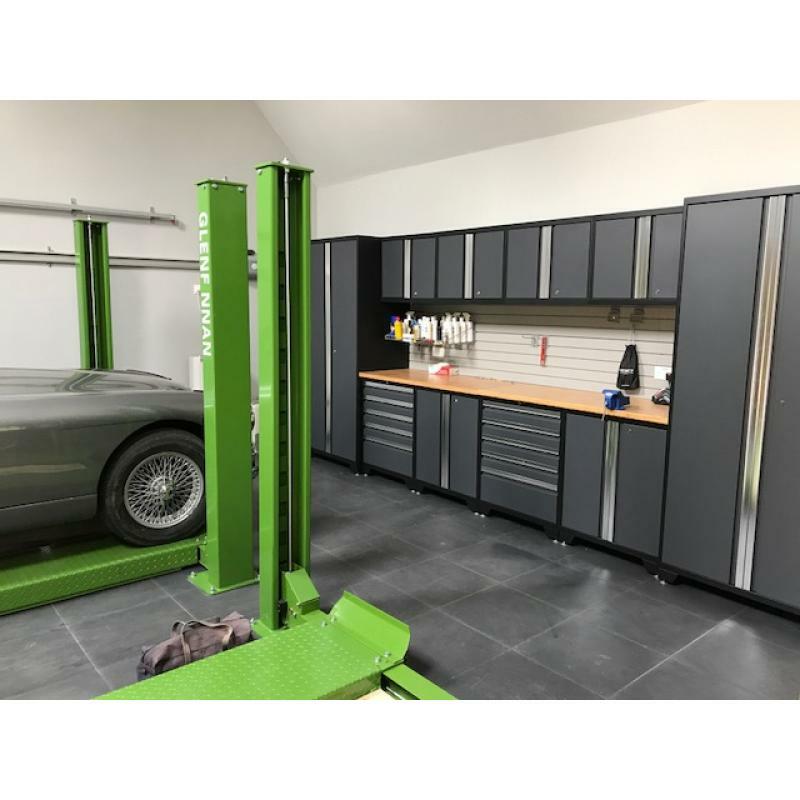 GaragePride designed, installed by the customer. 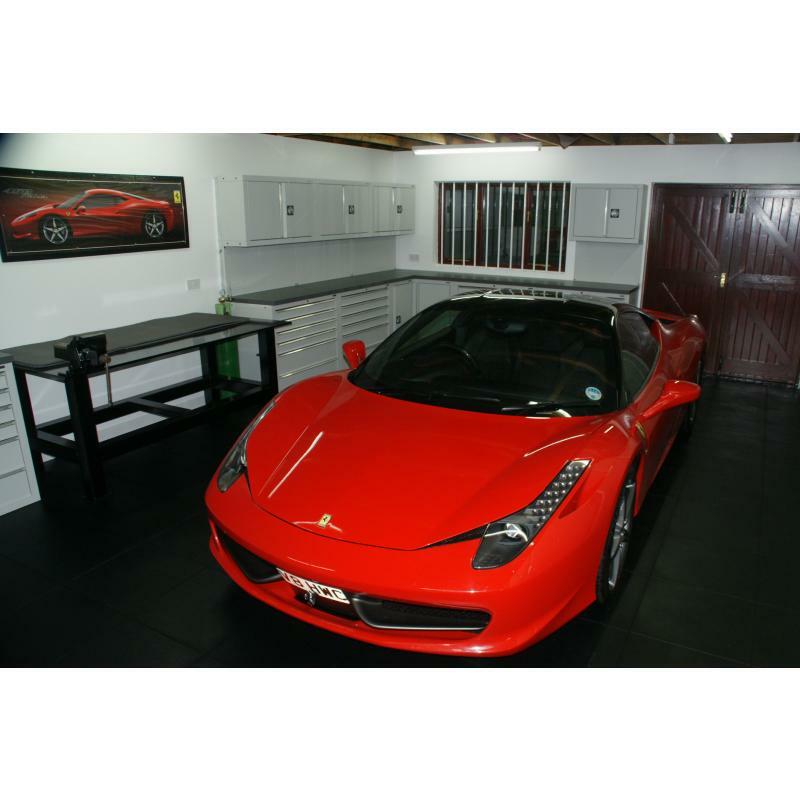 A gratuitous picture of a customer's Ferrari 458, with some cabinets behind. 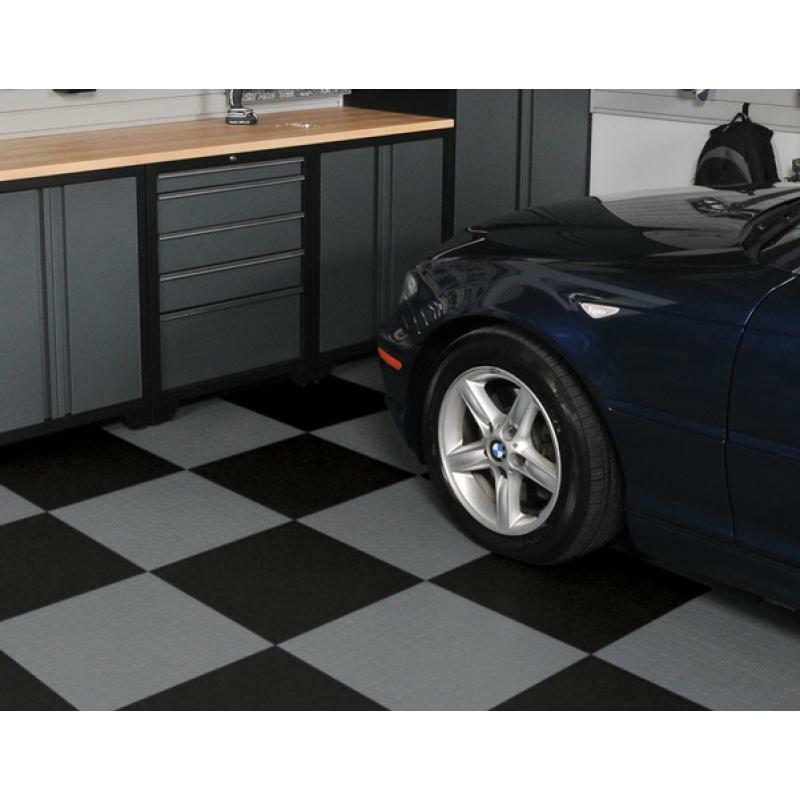 Pro Series cabinets with chequer pattern plastic floor tiles. 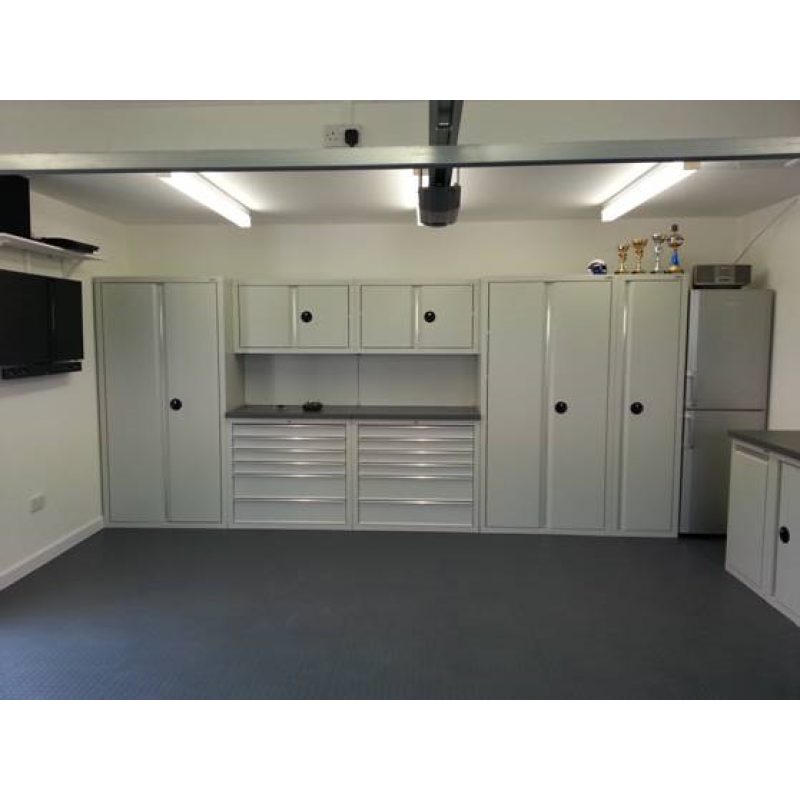 Cabinets in light grey, floor tiles and wall storage all supplied by GaragePride - Installed by the customer. 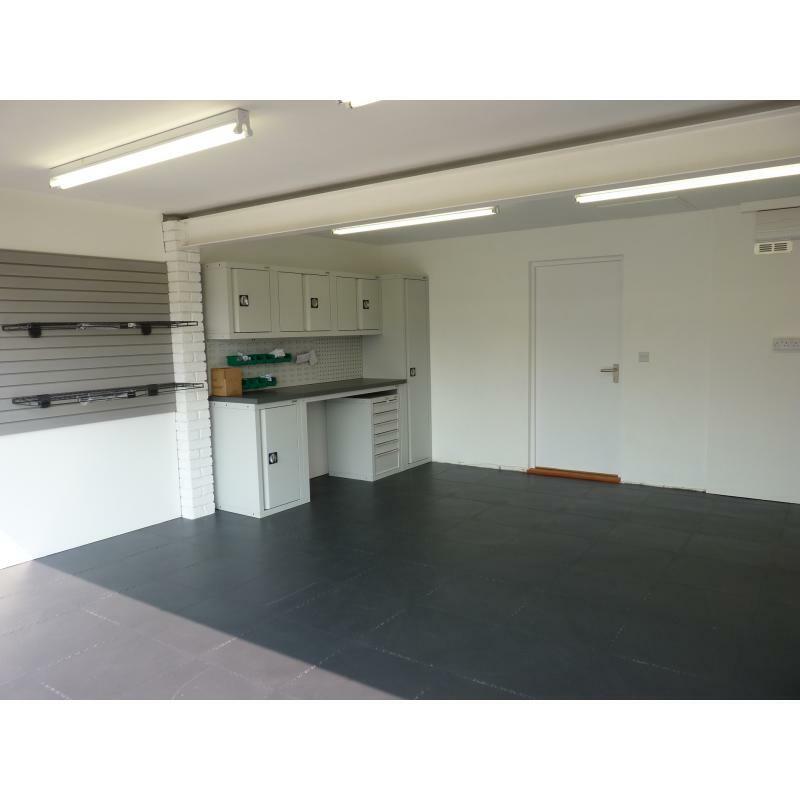 Cabinets, floor tiles and wall storage all supplied by GaragePride - this is why we call it The Forgotten Room. Cabinets powder coated all in white with a striking floor colour scheme. 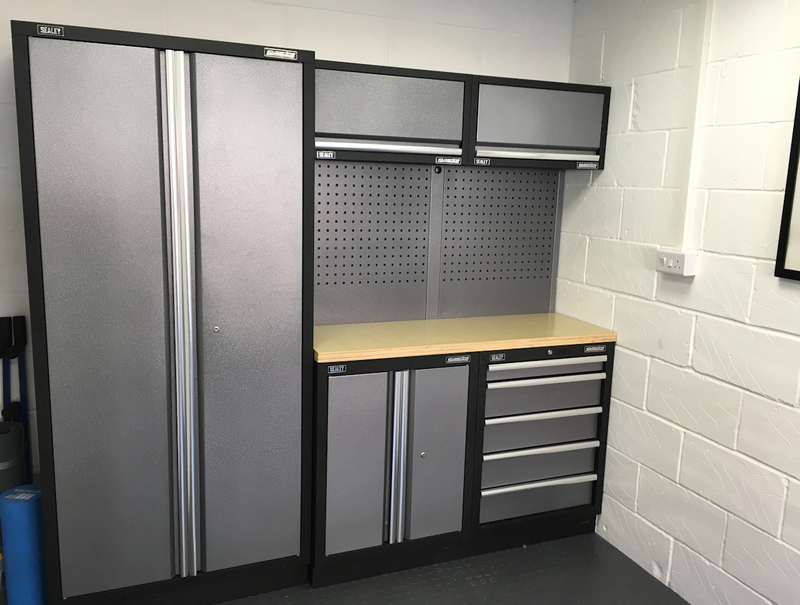 A customer's self-installed cabinets in light grey. 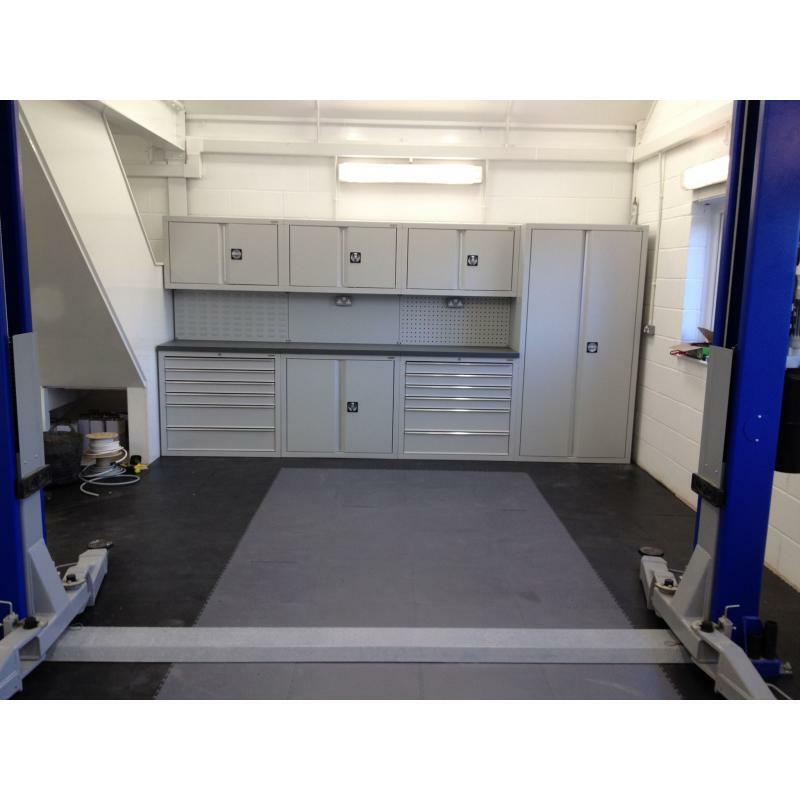 The layout was designed and visualised by GaragePride. A customer's delivery of cabinets just arrived ready for installation. 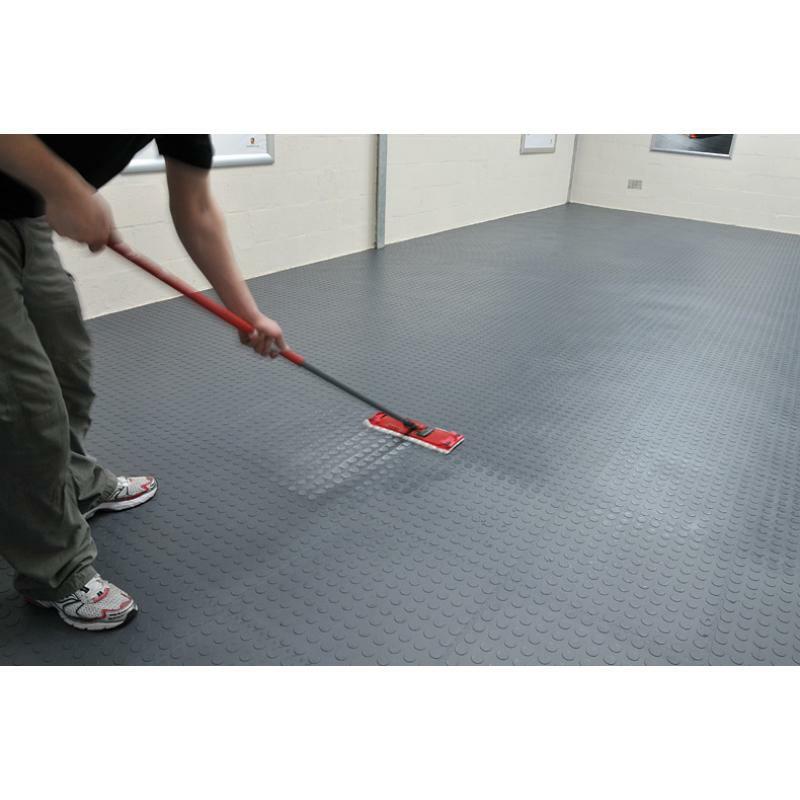 Our garage floor tiles are very easy to keep clean. 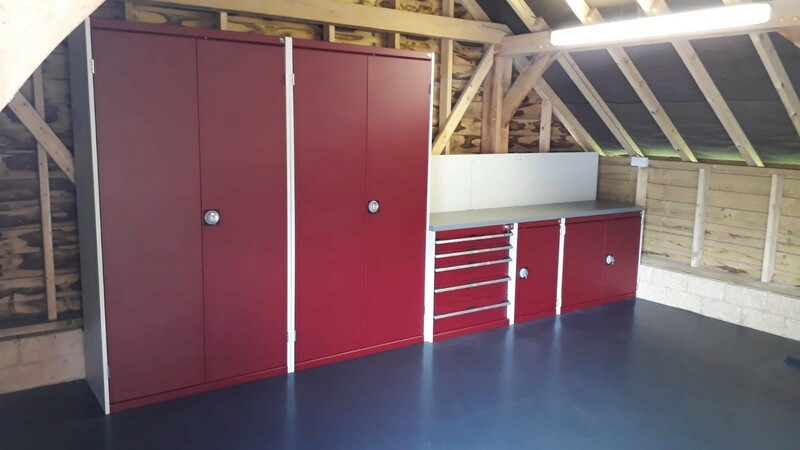 A simple but effective row of GaragePride cabinets with a worktop supplied by the customer. 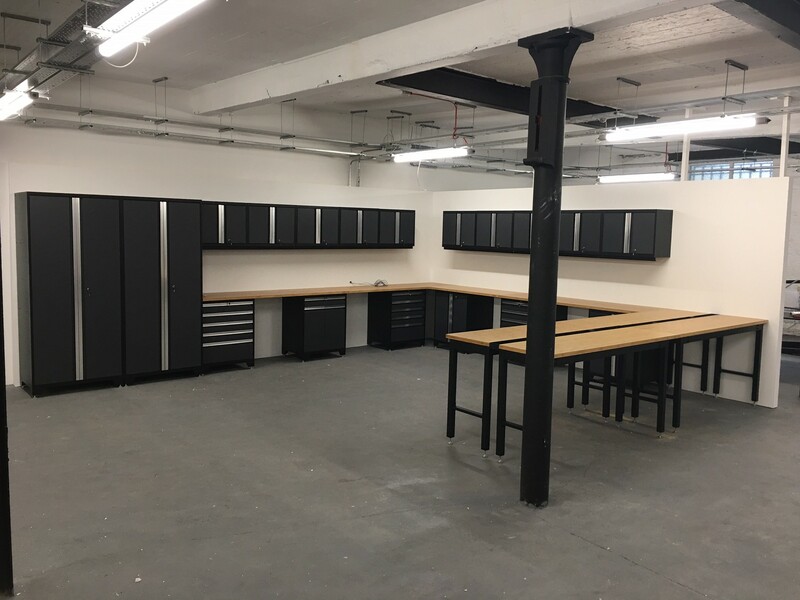 A 4000 mm run of cabinets fitting into a 4030 mm gap! 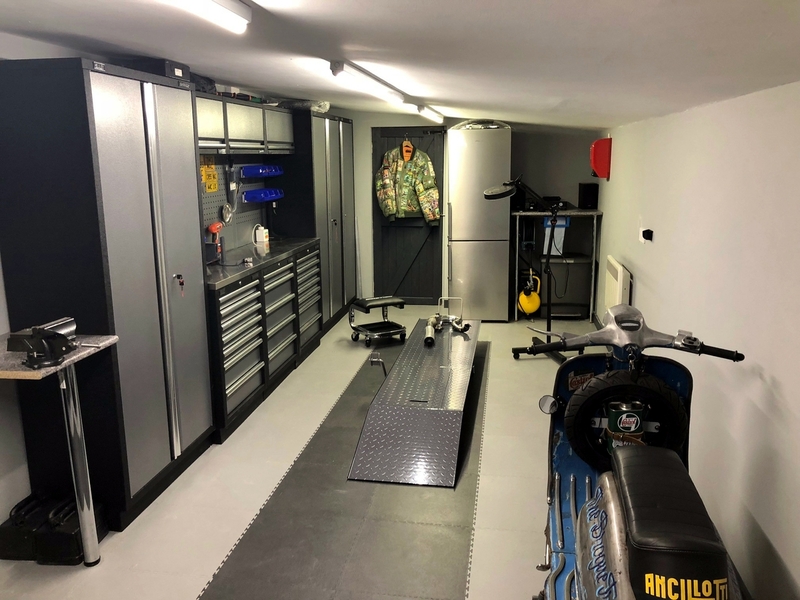 Installed by GaragePride. 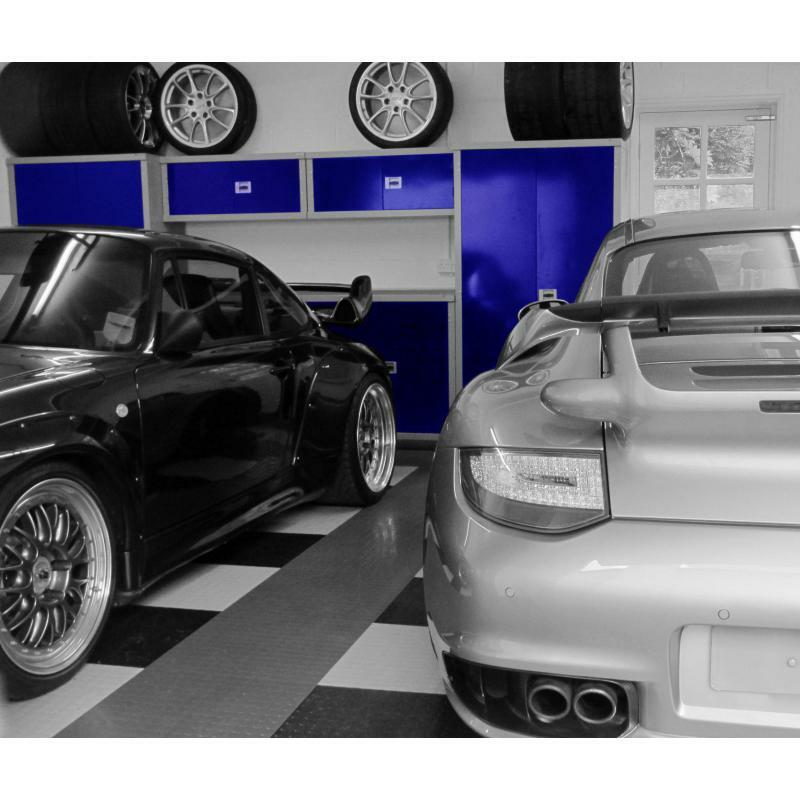 Two fine Porsches with GaragePride cabinets in the background. The colour was desaturated for effect! 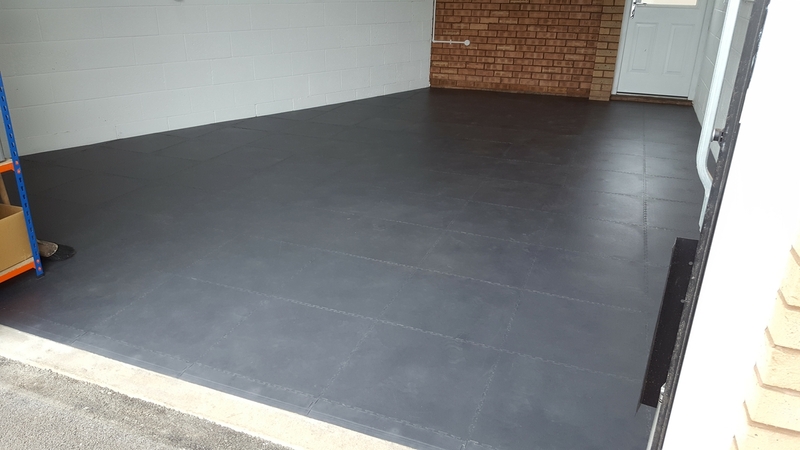 A single garage just laid with garage floor tiles - raised disk in dark grey. 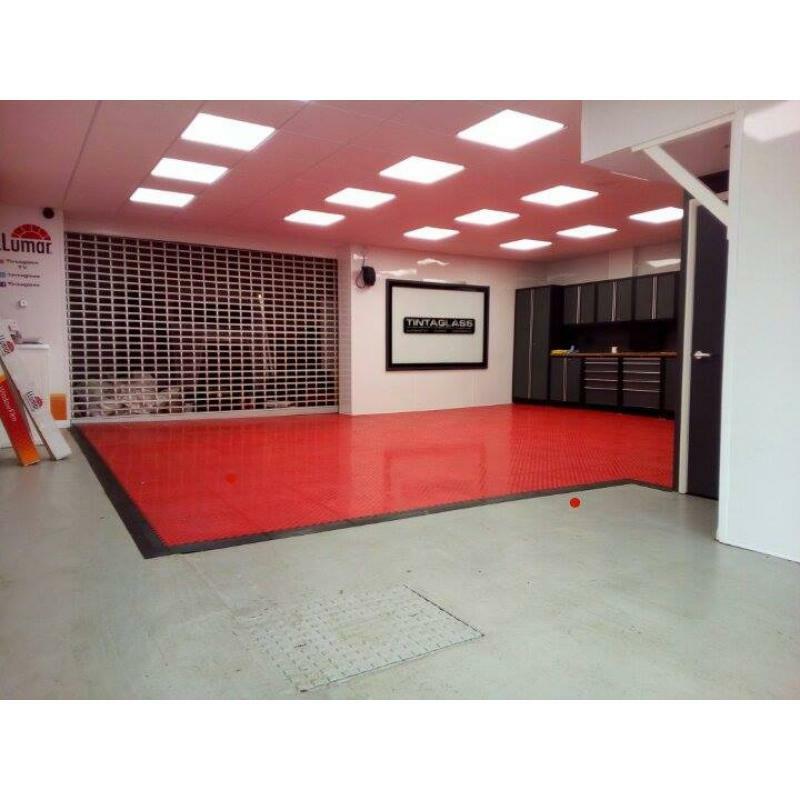 A large garage fitted with 7mm garage floor tiles in a pronounced cheque pattern. Tintaglass in Bristol. 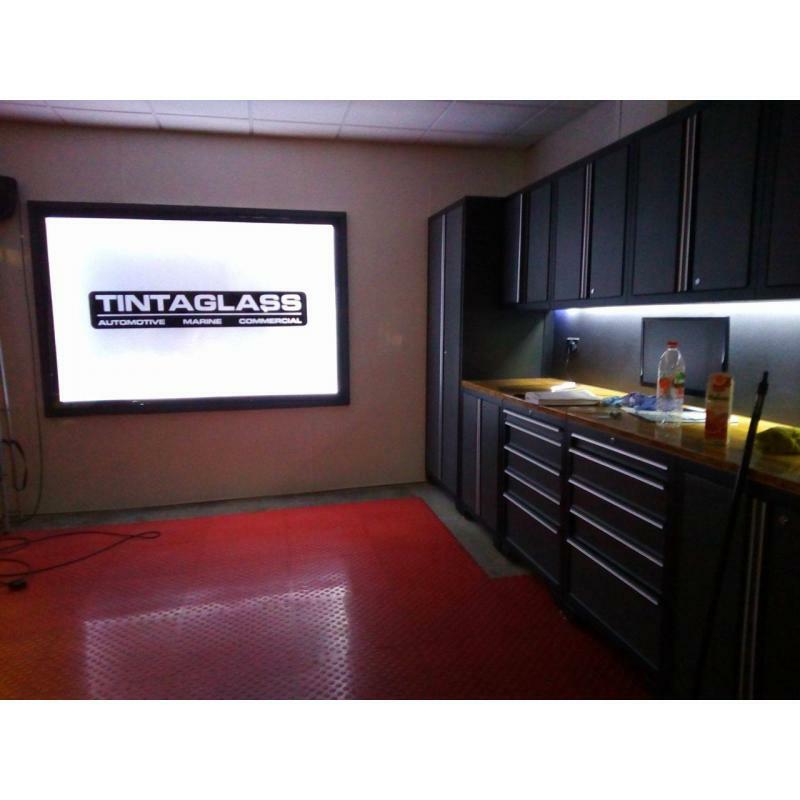 New workshop. Tintaglass in Bristol. 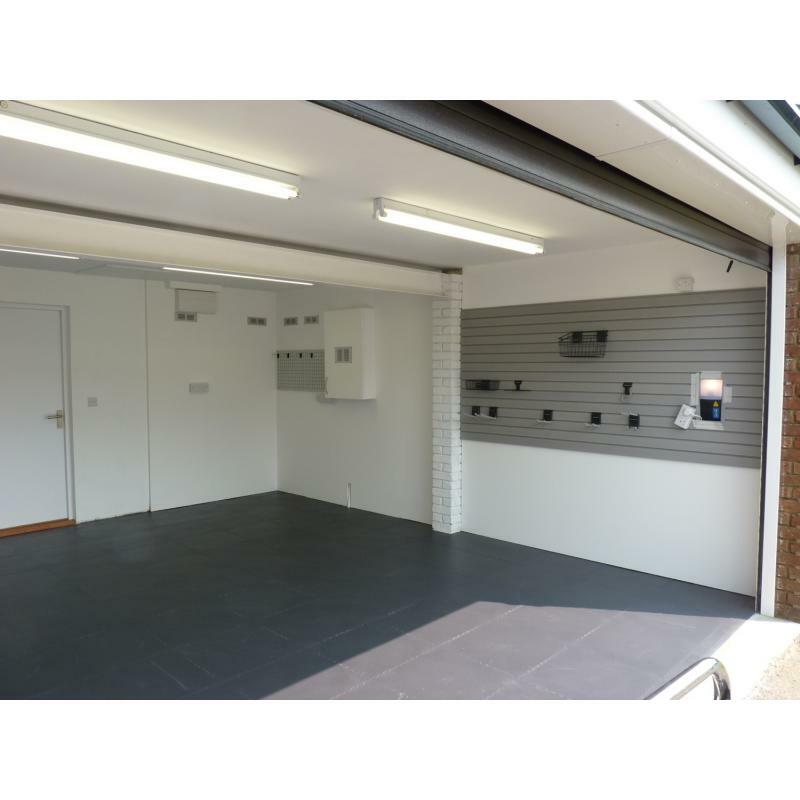 New workshop. 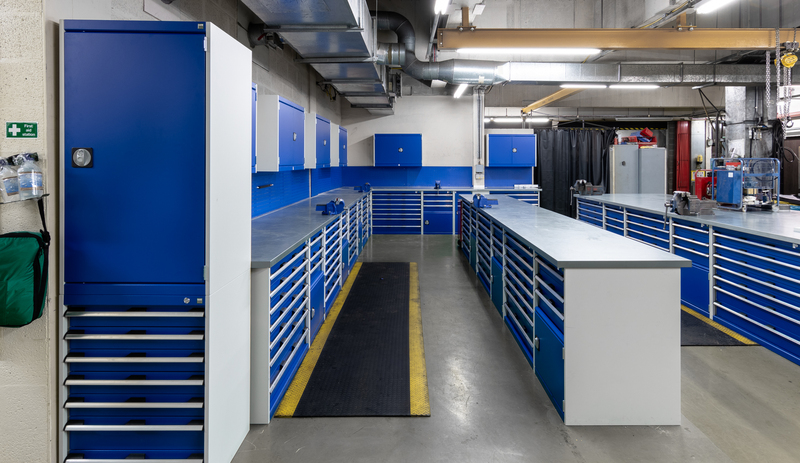 Pro Series cabinets.